It was my birthday last Friday! And I have been in celebration mode all week! The day started early, getting up to have breakfast with Guy before heading off to do the morning shift! 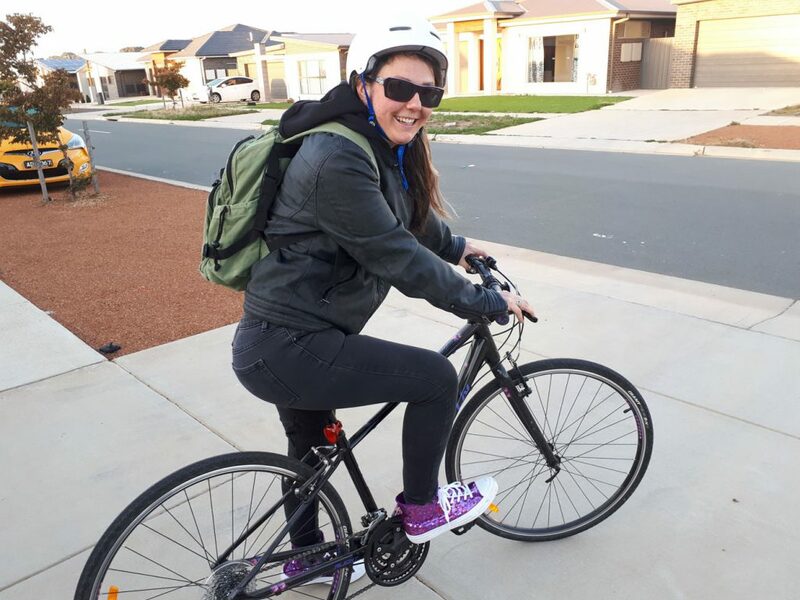 I donned my sparkly converse and pleather jacket and off I rode on my bike! Riding to work in style! I had a “chicken burger friday” date with Guy for lunch. The cafe at his work used to do an amazing fried chicken burger with pineapple relish. Alas, I got there, only to realise they had taken it off the menu and replaced it with a sub-par grilled chicken burger! Still, was pretty awesome to be able to have lunch with Guy, that doesn’t happen often! I only had a small amount of time between the morning shift, chicken burger Friday date and the afternoon shift, but I made the most of it! I filled it with something that never fails to make my heart hum! Sewing hexagons!! I’ve been collecting fabrics with a lot of texture – they have come in the forms of skirts, dresses, jackets, pants and shirts so far. Making hexagons on my birthday! I had an amazing pair of velvet pants, but I hated the cream colour, so whilst I had the dyes out last week, I threw some dye on them as well. 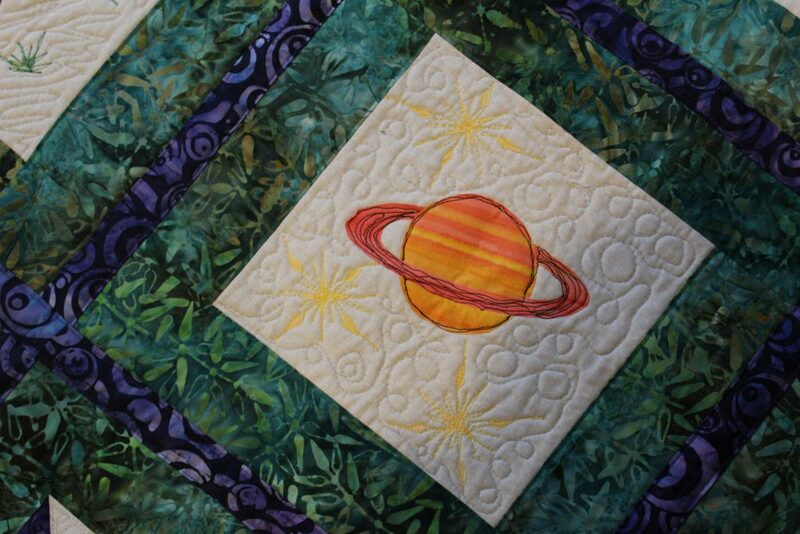 I love them and they are going to look fantastic in this new hexagon quilt! a pair of deconstructed velvet pants await the dye treatment! Guy got me a copy of the new Lego Movie 2 PS4 game. But of course we couldn’t play it without first seeing the movie! So we went to the mall for dinner and a movie! And then the celebrations spilled over into the rest of the weekend. We stayed in the city Saturday night. Setting up the PS4 to play the Lego game. We had an amazing four course dinner at Courgette, which was epic, to say the least! Then Sunday morning we finished off the celebrations with pancakes at the Pancake Parlor! Heading off for Birthday dinner! 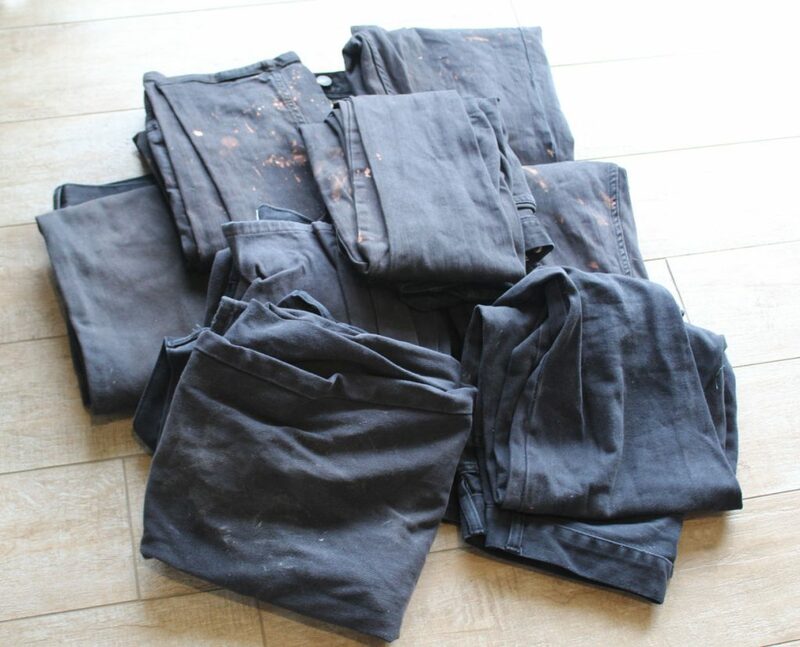 We also managed to hit up the Green Sheds free clothes bins for some denim jeans to add to the up-cycling pile! And now school is on holidays, so I’m working longer days at my “day job” which hasn’t left me much room to be super creative. 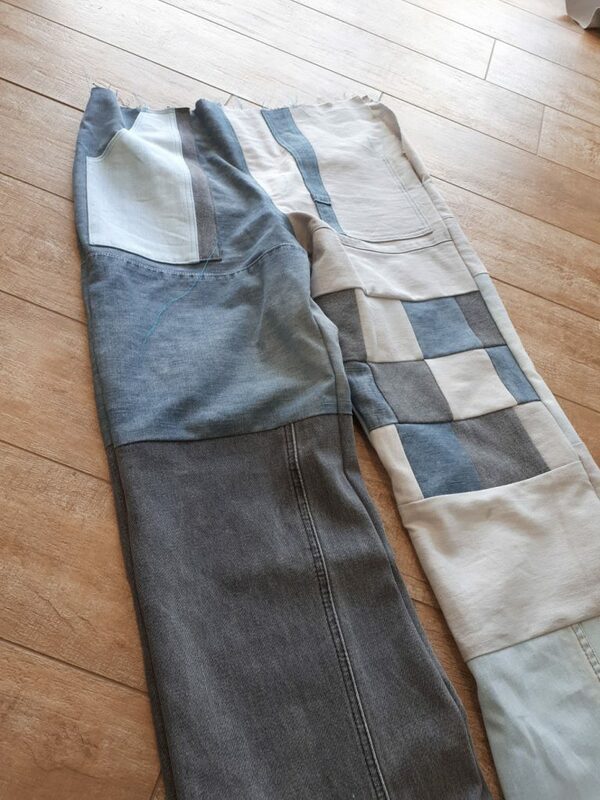 I’ve been trying to get a pair of up-cycled denim overalls finished, but it just hasn’t happened yet! The pants part of my overalls. I have made the bib and back, I just need to attach them to the pants. 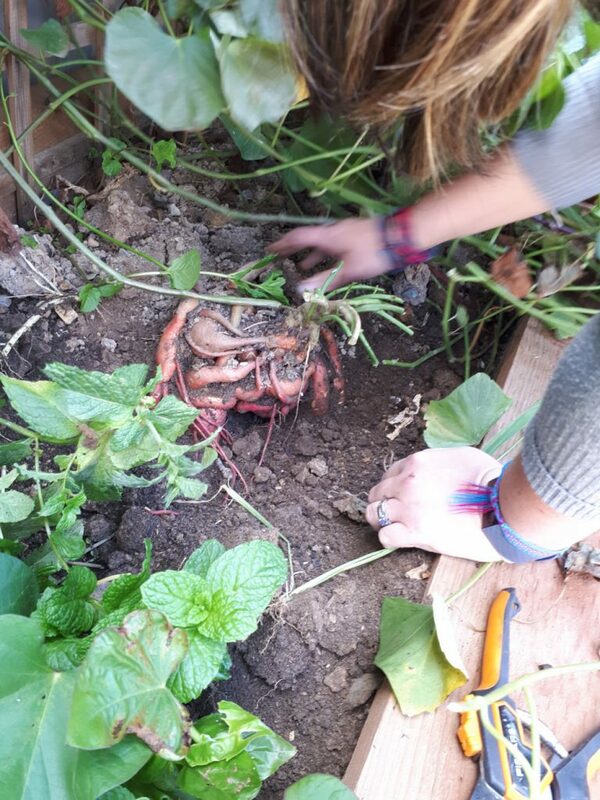 We are also digging up the garden and getting ready for winter crops. We harvested one of our sweet potato plants! It came up in one big tangle! Easter is also on our doorstep. I’ll be heading home to help Mum and Dad paint their dining room. My sister has suggested we try and squeeze some dyeing in there as well! Until then – Have a very happy and safe Easter! We got a spare bed for Guys study a couple of weeks ago. Its basically a single bed with two single mattress, the base pulls out so the mattress can be placed side by side to form a king sized bed. We were brainstorming the best ways to cover it for ever day use as a day bed. 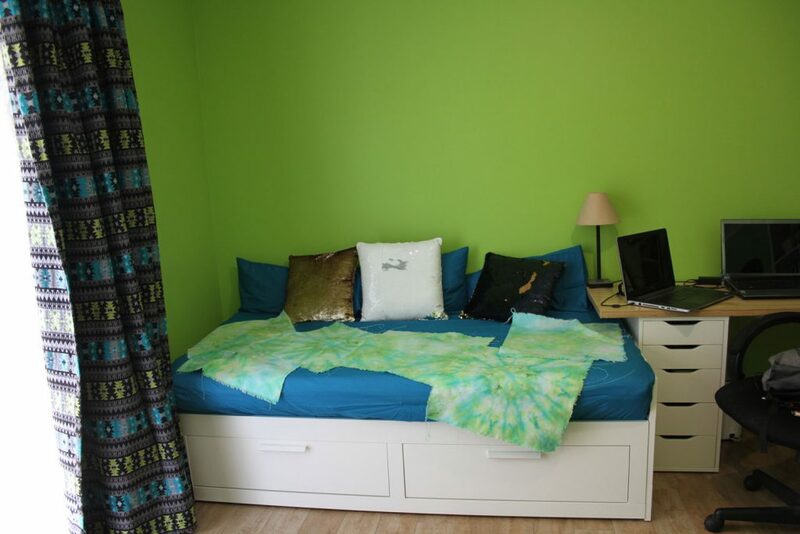 The room is painted lime green with white trim, the curtains are black/grey/teal/lime green. 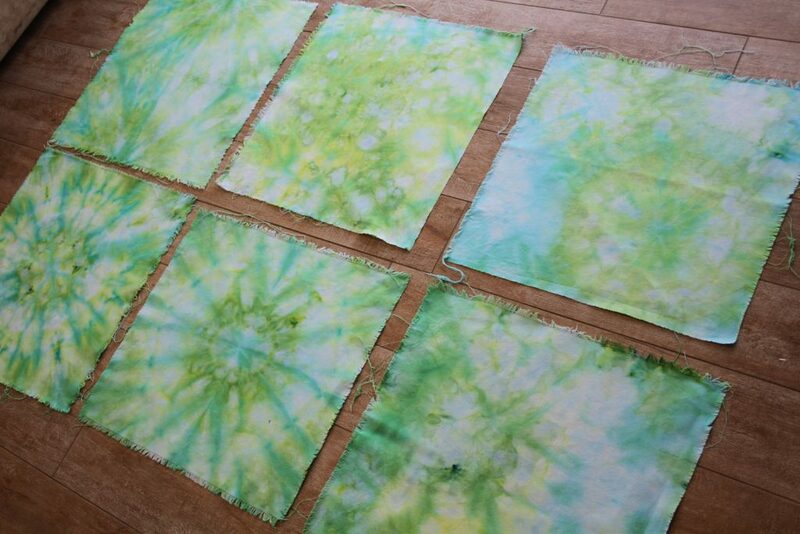 I suggested an ice dye could be a fun addition, and so the experimenting began! 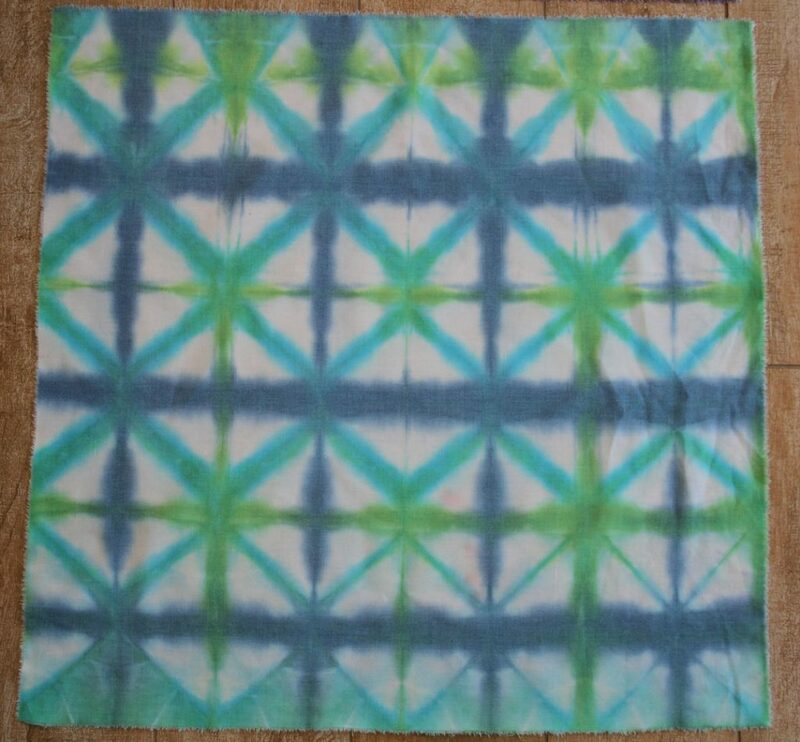 I ordered a box of dye, found some fabric, and got my dye experimenting on! 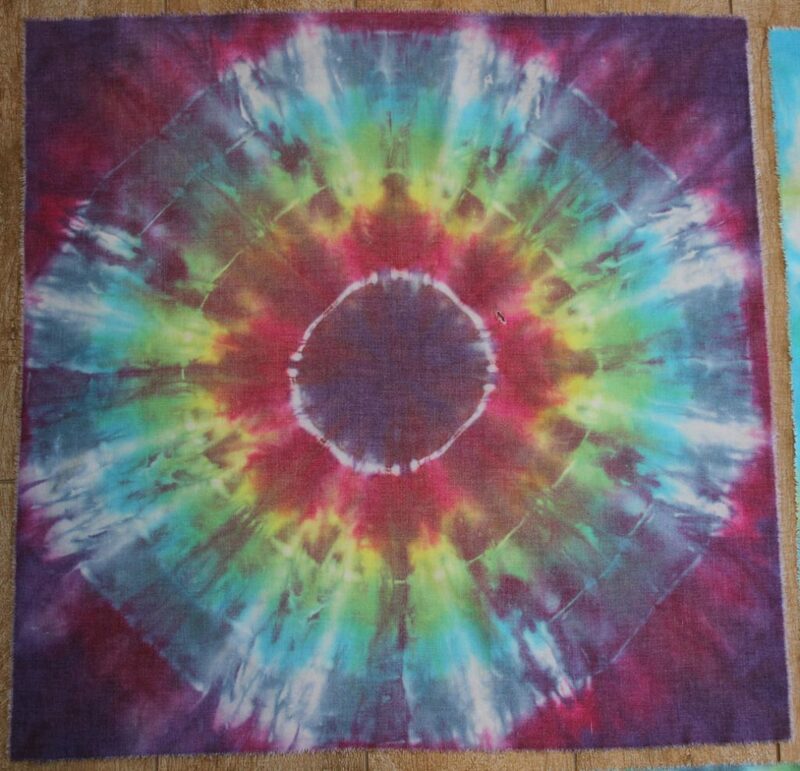 First up I tried ice dye. 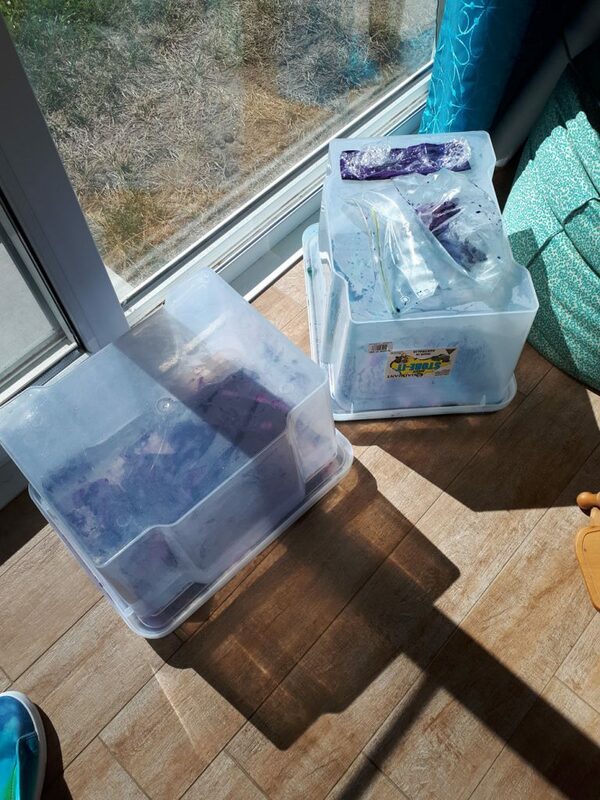 I tied my fabric in various ways, laid them on cake coolers in the bottom of a box, layered it with ice, then sprinkled dye over the top. I put the lid on the box and left in in the sun. And waited. 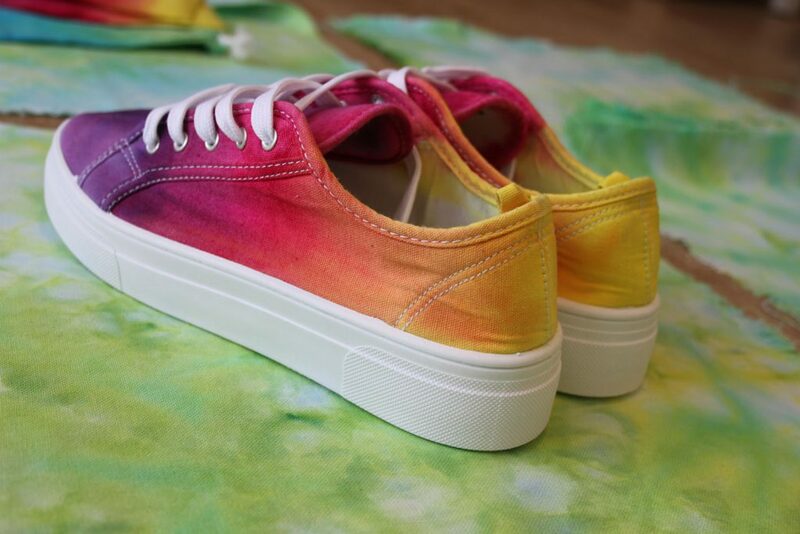 The waiting is the worst with tie dye! You want to know if it turned out now! But know the longer you leave it the better it will be! 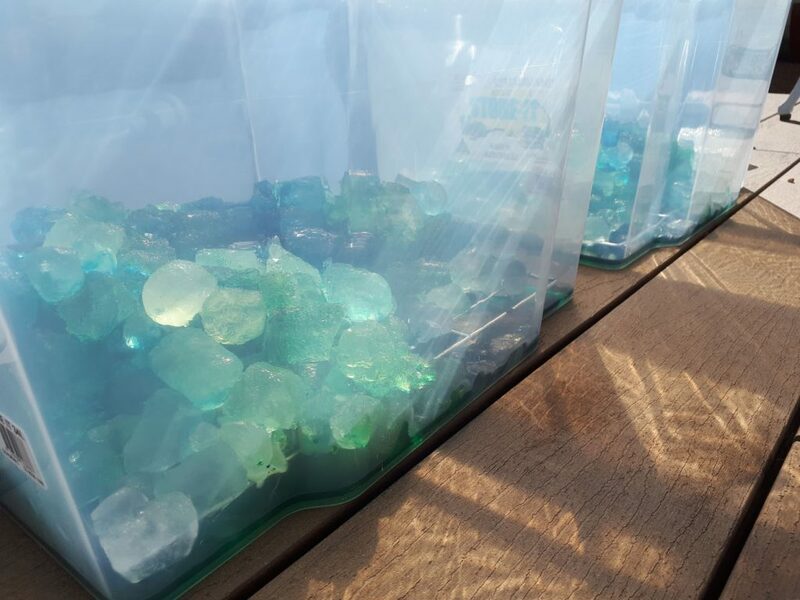 The idea behind having cake coolers in the bottom of the box was that the ice would melt and drain away from the fabric. But I miss calculated the volume of liquid the ice would turn into, and the fabric was left sitting in the muck anyways. 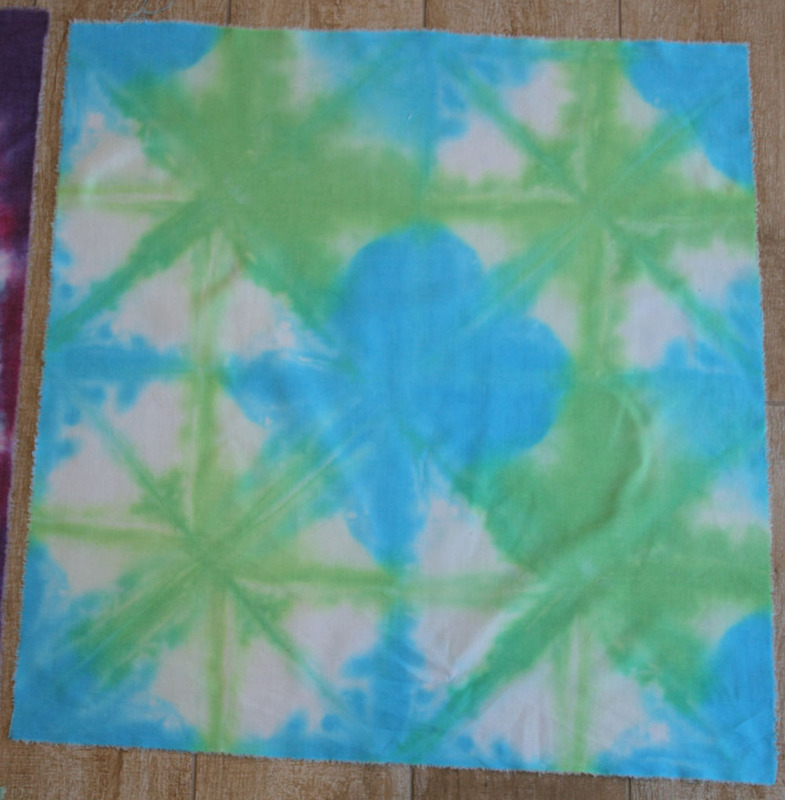 It wasn’t a complete fail, I was pretty happy with the results for my first go at ice dyeing, although I do have a lot more experimenting to do before I commit to a large enough piece of fabric to cover a single bed! This is the room and bed we are looking at making a cover for. Currently the bed has a teal sheet coveing it, but we want to make a cover out of some more robust material. I’ve found this lovely cotton/linen blend that is almost like a soft canvas. Whilst I think about the ice dyeing process and how to get better results next time, I’ve been doing some other dyeing as well. 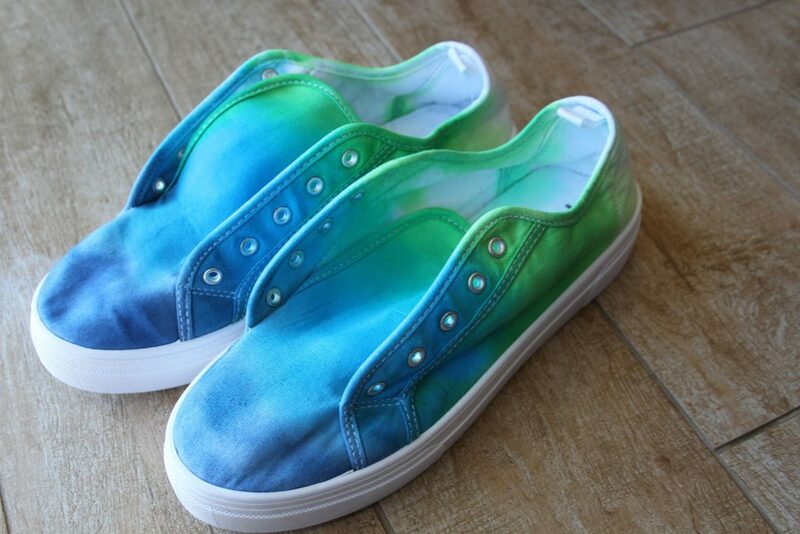 Guy sold a pair of shoes I dyed as practice before dyeing our converse. He had so many inquiries about them, but they were the wrong size for most people. 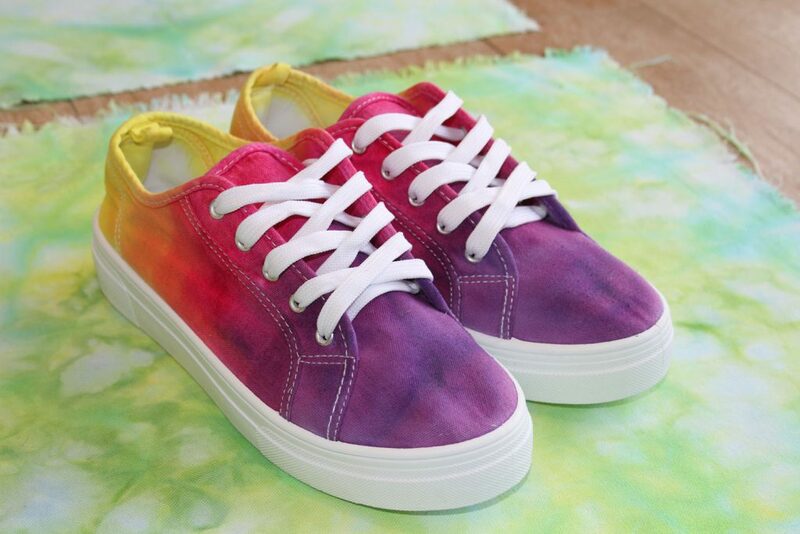 It made us realize that there are plenty of people out there who would love their very own pair of hand dyed shoes! So I grabbed another couple of pairs of canvas shoes from Kmart and tried out different colour combinations. 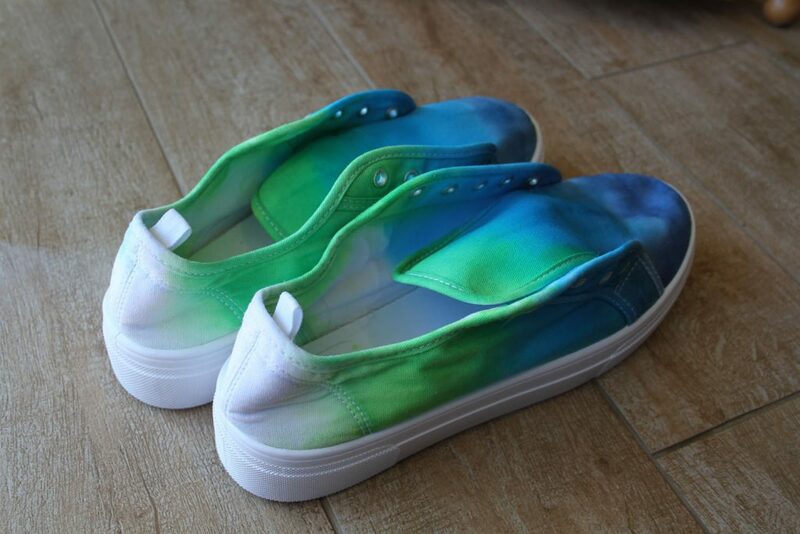 I think I have this shoe dyeing thing down pat! these shoes are still drying after pulling them out of the washing machine this morning. The dark blue rinsed out more than I was expecting. And then I was bitten by the dyeing bug and couldn’t stop. I have a stash of white bed sheets, which, after our recent clean outs, found there way into “Cate’s up-cycle pile” yay! I ripped one into some smaller pieces and have started working my way through “Orizomegami” a book written by Kristin Lawson, published by Artwear Publications. It has been a good way to get started and I’m slowly seeing where or how I could change bits to make them look different. I’m looking forward to stitching back into some of these pieces. 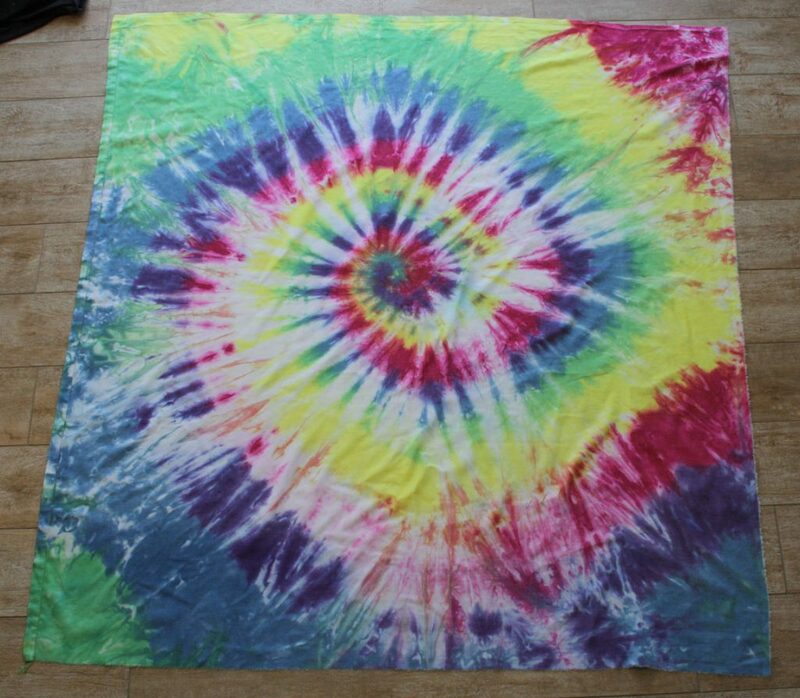 I envision my hand dyes being used in quilting. 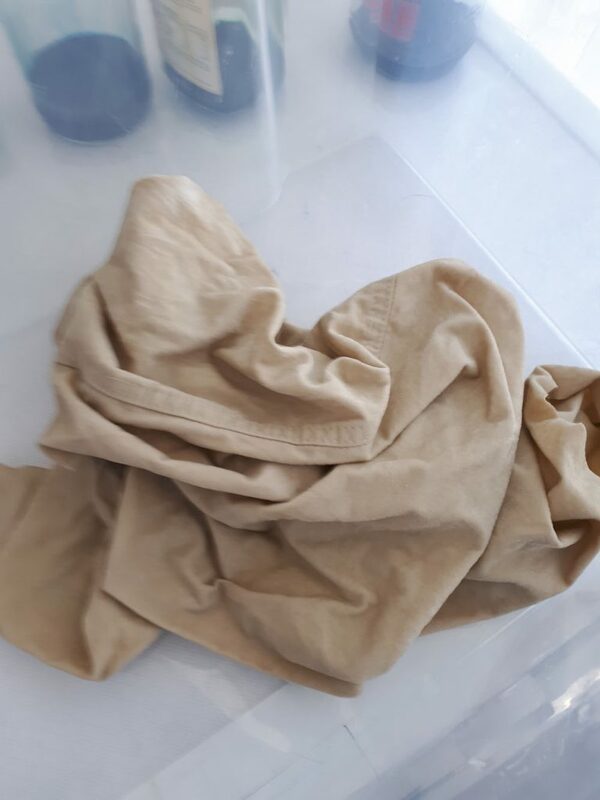 The sheet I used obviously has some polyester content, it came out more muted than I would expect 100% cotton to dye and you can clearly see the warp has not taken any dye. I have so many projects on the go at the moment. 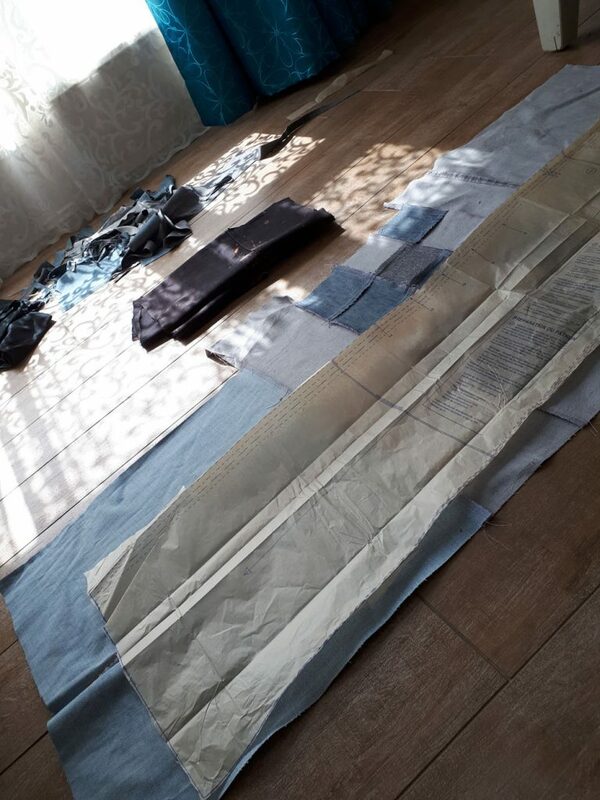 The lounge room is covered in bits of cut up denim as I work to up-cycle some jeans into a pair of overalls. And I need to make a birthday present for my niece! I’m loving dyeing so much, my set up has expanded to take up most of the laundry cupboard, there are things drying in front of the dining areas windows and on the backs of chairs! 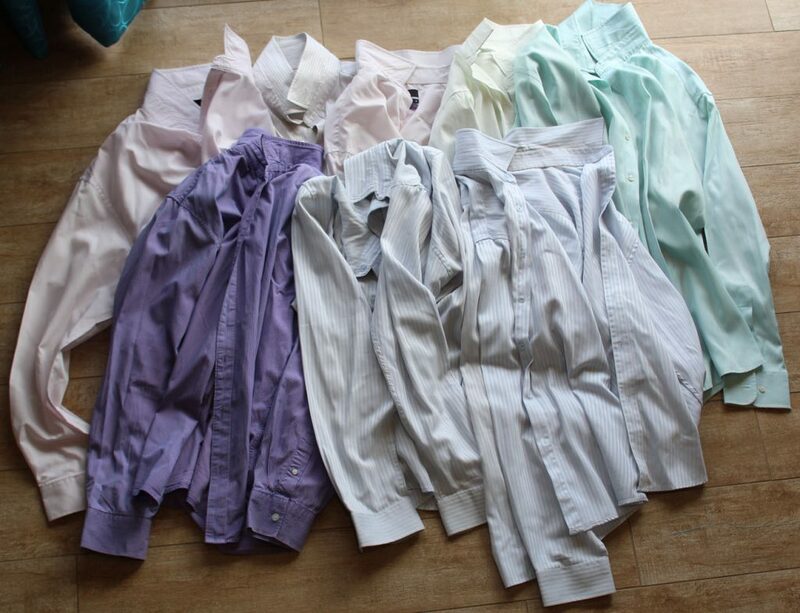 After Guy cleaned out his cupboard, I was left with a bunch of his work shirts that didn’t fit anymore. Work is in need of paint smocks for the children, so it made sense to grab them to use as paint smocks. In the past I just rolled the sleeves up, put them on the children backwards and buttoned up the top button. But I thought they might be a little more child friendly with a few alterations. I cut off the cuffs above the button detail. I removed all the buttons and put them aside. They might come in useful another day. 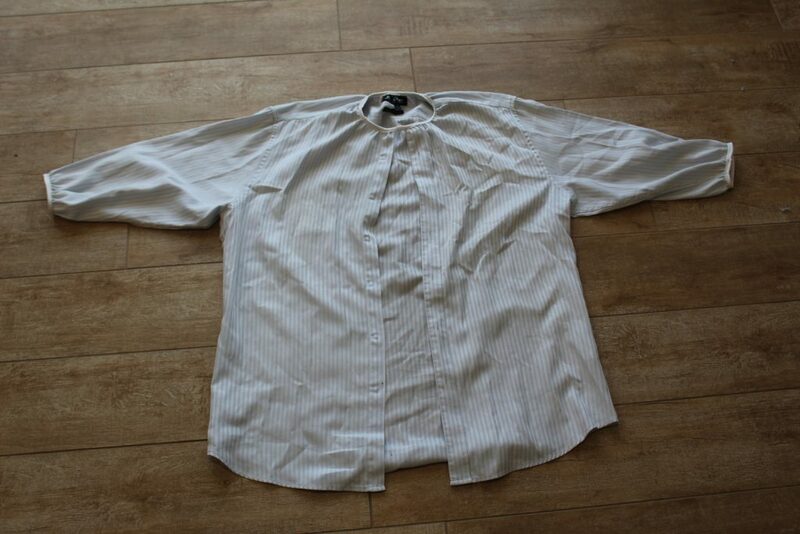 The shirt looks a bit like this. 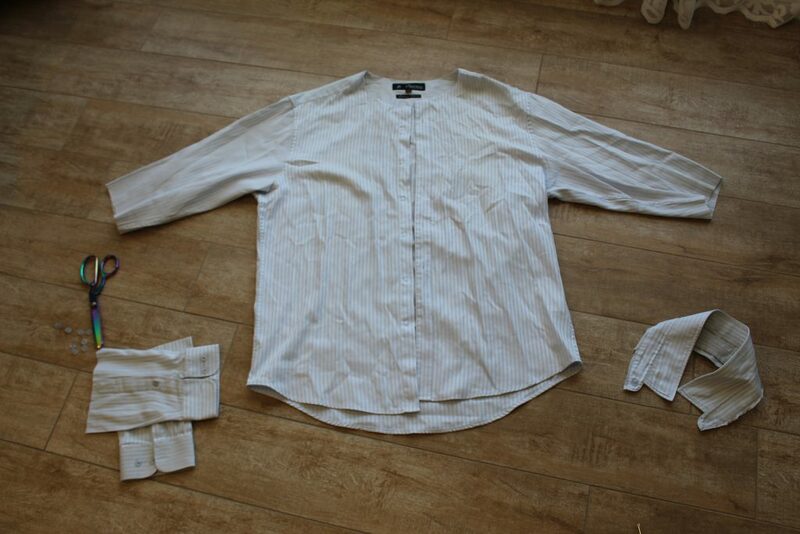 The sleeves are off and so is the collar. I removed the buttons because I might be able to use them in another project someday. I bound the sleeves and collar with fold over elastic, pulling it slightly as I went. At the neck area I left a very small gap where the fronts meet and continued around with the elastic. I used the elastic to join the two edges together. I left a gap between the edges. 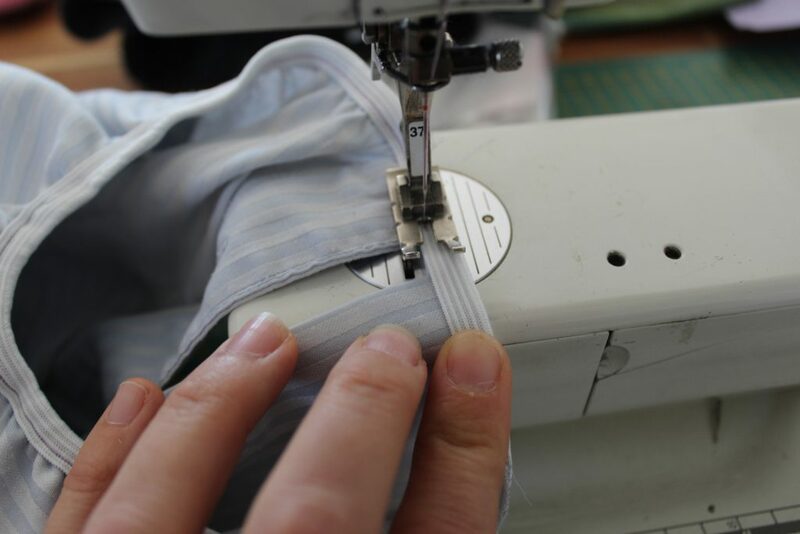 When sewing the elastic in the gap, make sure you are still pulling it, this will make sure the stitching doesn’t break when it is stretched in use. And wala! 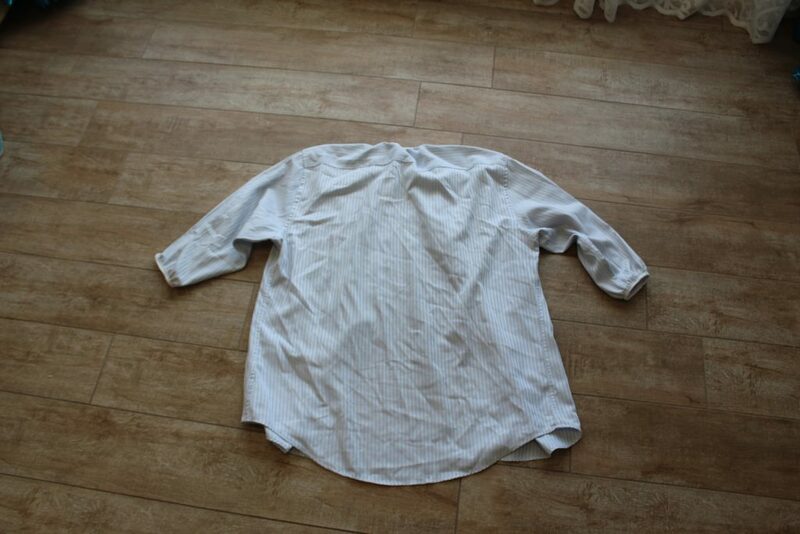 A paint smock from a shirt! Hopefully they do the job! 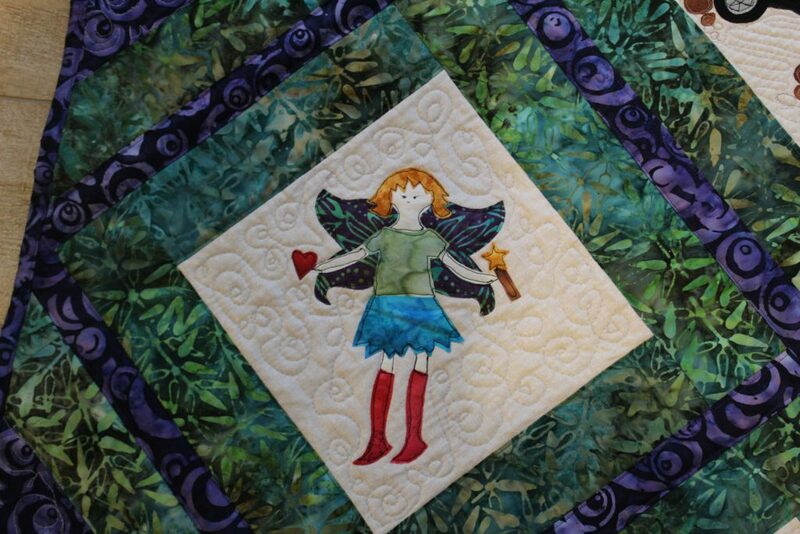 I was quested with making a very special family quilt. It was to be gifted to the mother of the family for her 70th birthday! 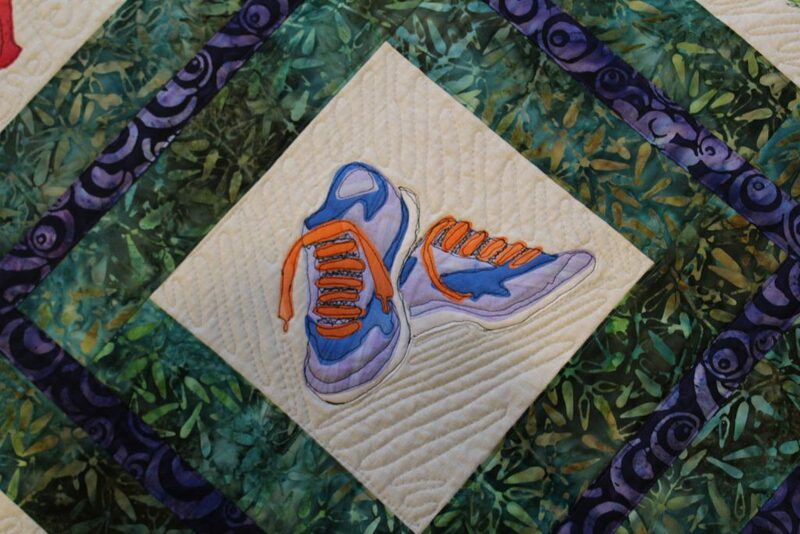 It was such an honor to create this quilt, and I hope it is enjoyed very muchly! I learnt a lot through the process. I taught myself some new techniques (yep, very brave of me) and experienced commission work to a brief. I found a lot of things I can improve on for next time, but I am ecstatic with the finished product! The original concept. It changed a bit, with new things being added and changed! I honestly can not tell you its dimensions, I was too keen to send it off on its next adventure to take the time to measure it. 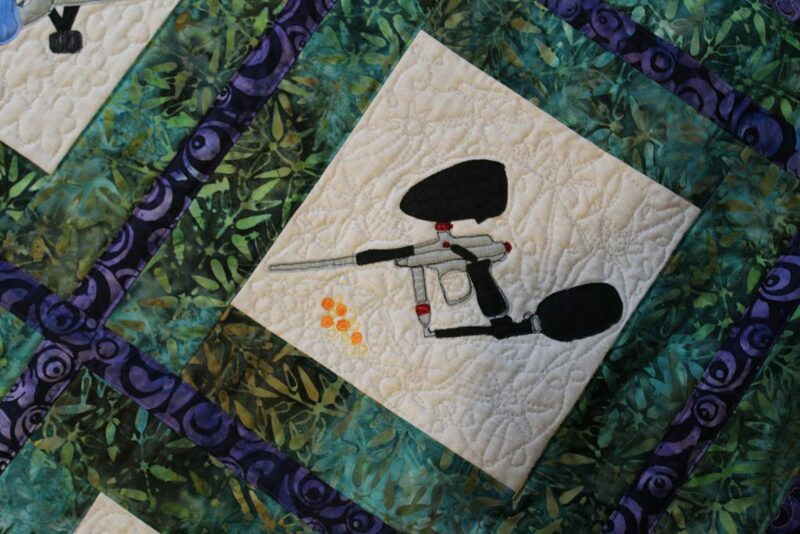 I did make sure I got some photos of it, I’m notoriously bad for not documenting my quilts before I gift them! 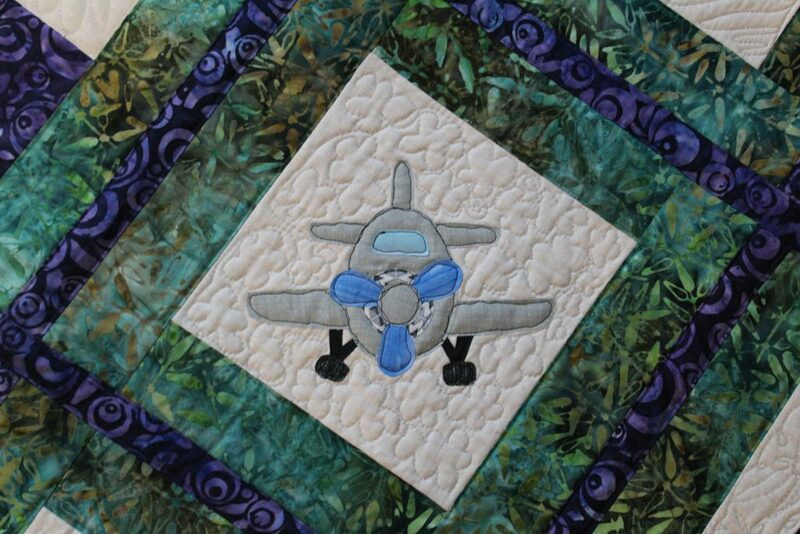 I used vlisofix to attach the appliques, I then used free motion quilting to stitch them down. 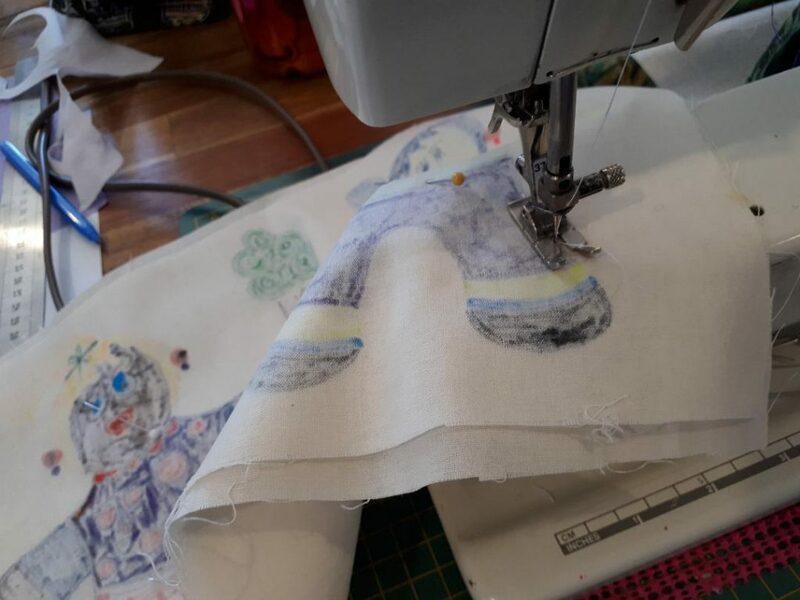 I had experimented with free motion stitching at a very basic level some years ago, this was a massive stepping stone and I’m so glad I gave it a go! I love the results. I used the technique of “quilt as you go” to put the quilt together. 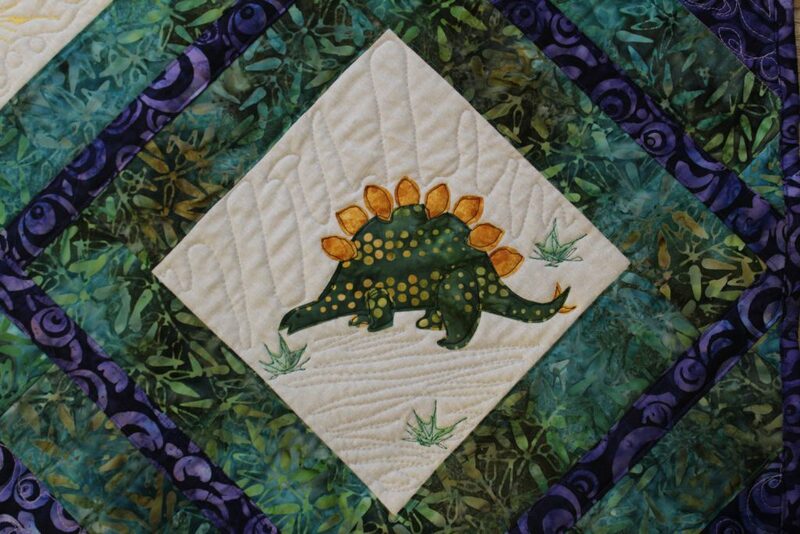 This meant that each square was individually quilted BEFORE it was sewn together, unlike in a traditional quilt where you sew the top together and then quilt it. 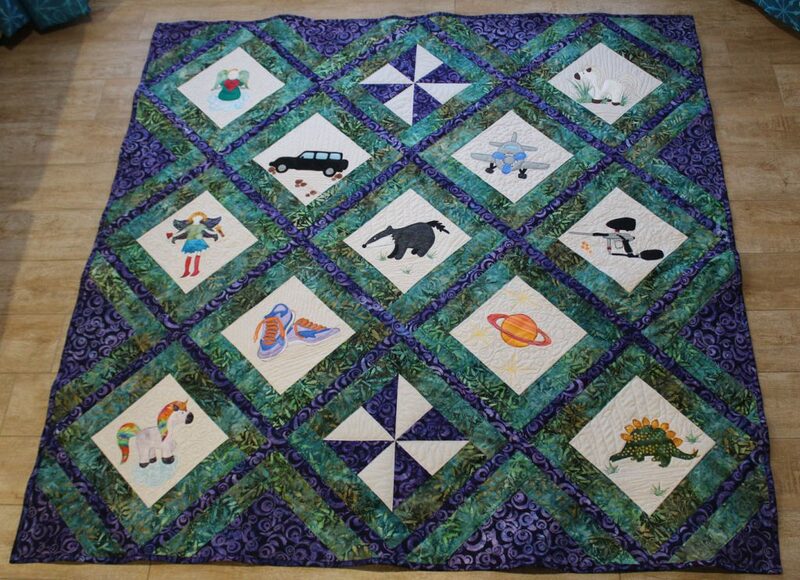 I then used “tram ways” (the purple borders) to stitch it all together. 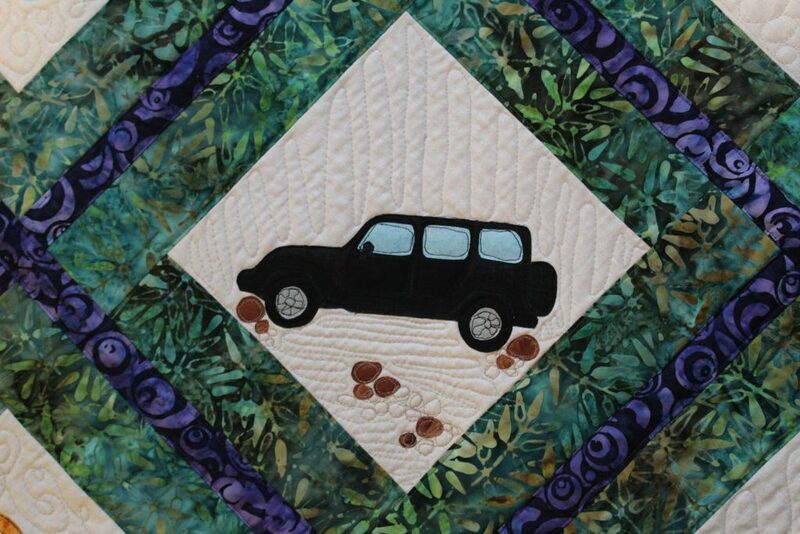 Pretty much the entire quilt was sewn on the machine. 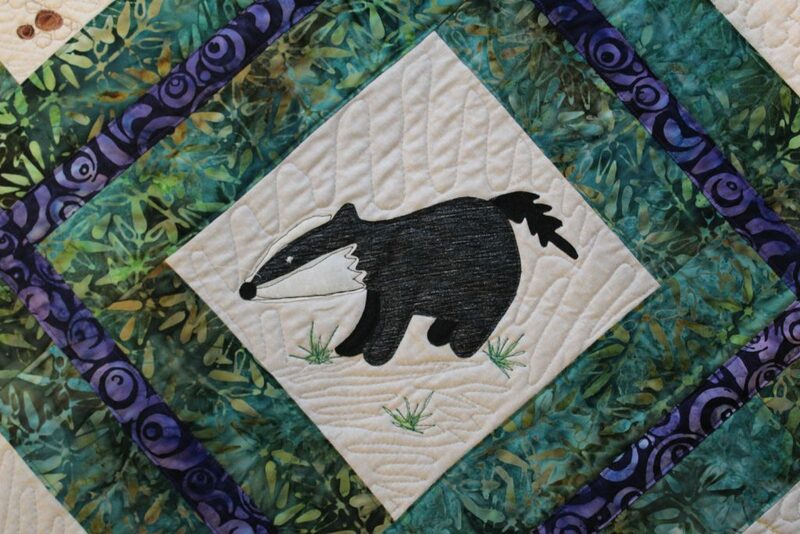 The only hand stitching was a few stitches for the badgers eye. I also hand stitched a label on the back so a message could be added before gifting. I sourced or drew the appliques. Each block represents a different family member. I used black thread to out line the image, grey thread in the back ground and some blocks have a colour thread for any objects in the background as well. 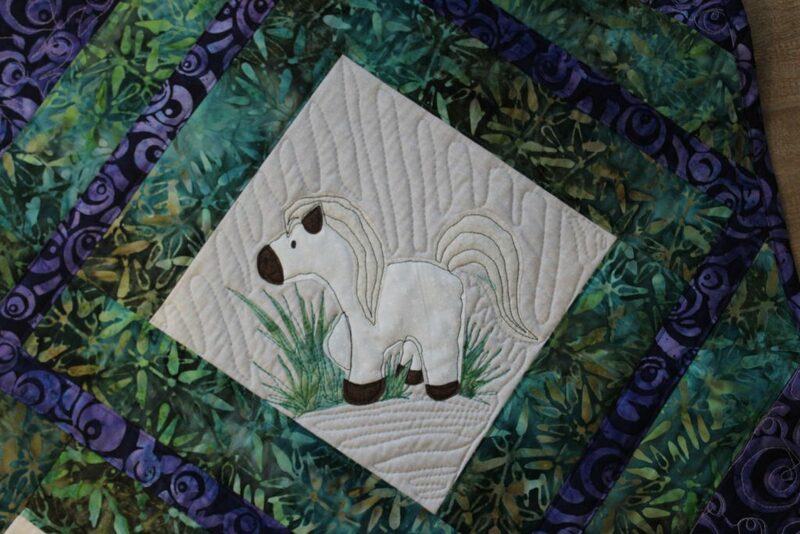 I hope this quilt is cherished as much I enjoyed making it! My studio is currently stocked to the gills with garments and fabric for upcycling, and that’s before you open the door to the garage! Over the last few weeks, Guy and his two youngest brothers have had massive clean outs of their cupboards, for various reasons. Hooray for me! I have had the opportunity to sort through most of it and collect everything I could use! I’ve got a pile of bleach stained jeans. These are screaming ‘bomber jacket’ to me! I’m thinking they could benefit from some areas worked back into with bleach in a more controlled way, maybe a vine motif or a mandala could look good. 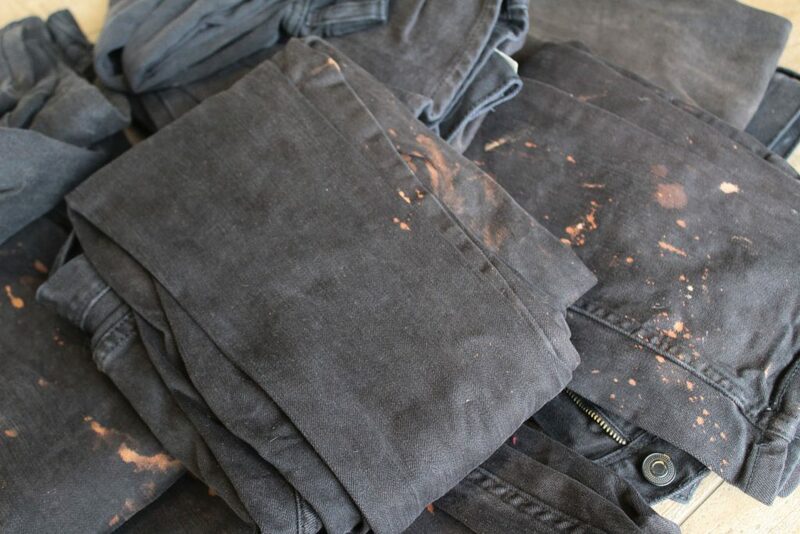 a pile of bleached black jeans to inspire! Some t-shirts will become yarn. 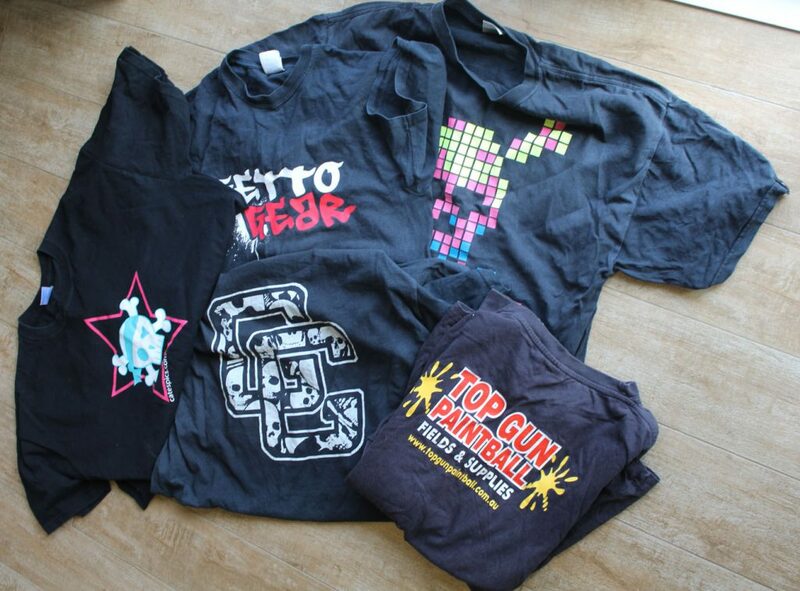 And these t-shirts will be used to make my paintball t-shirts quilt a little bit bigger. I’ve also been collecting highly textured fabrics from the op shops. I’m thinking a hexagon quilt with big hexagons! highly textured fabrics will become a new hexagon quilt! It is becoming more important for us to be considering our textile use footprint. Up-cycling these items are my small way to reduce textile waste. Stay tuned to see what I come up with in the following weeks! 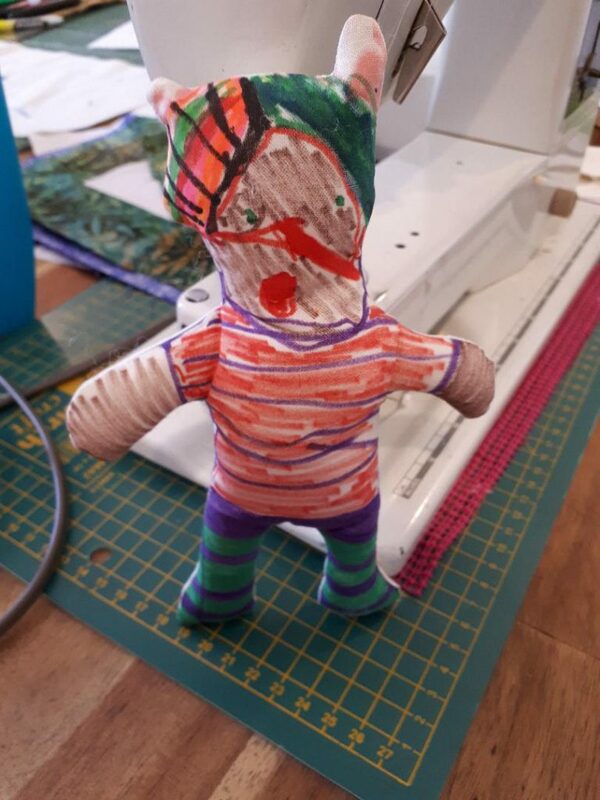 My heart was absolutely melting as I stitched these dolls up! They are so damn adorable! 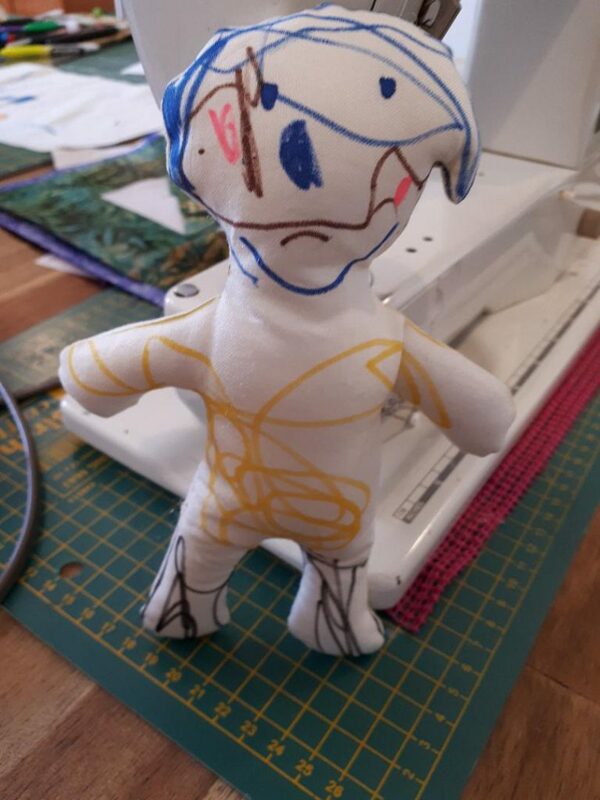 My heart was melting as I sewed, these dolls turned out super cute! 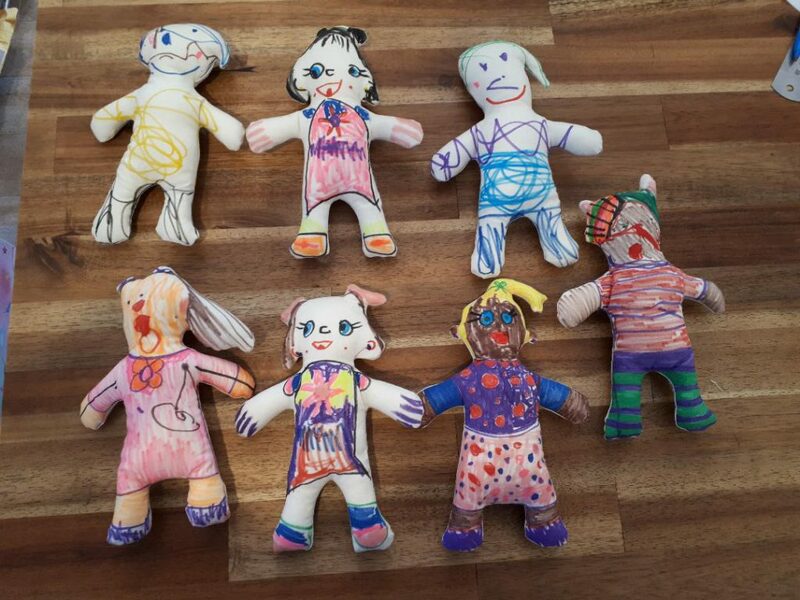 These dolls are a simple rag doll, which encourage creativity and develop a usable resource at the end. 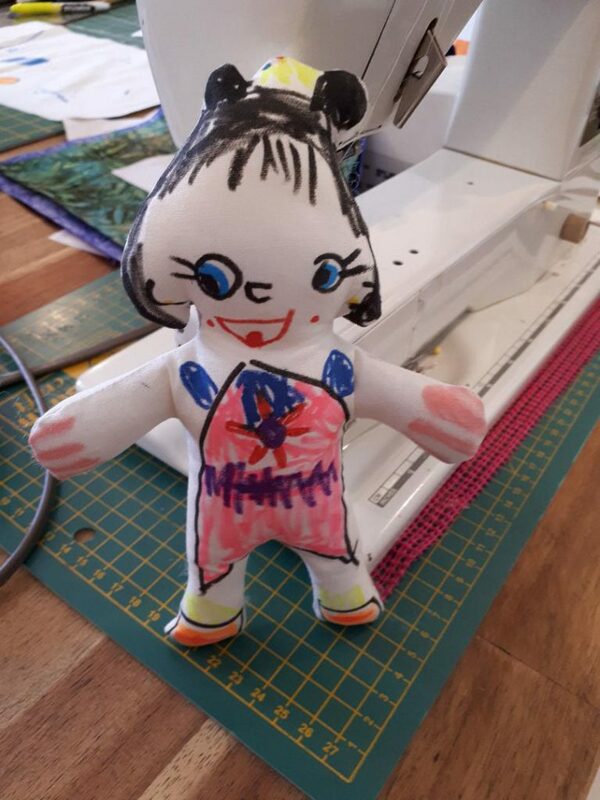 I had children do the drawing, whilst I did the sewing, but you could use it as an introduction to sewing as well, whether it be hand sewing or machine sewing. We just weren’t quite there yet. 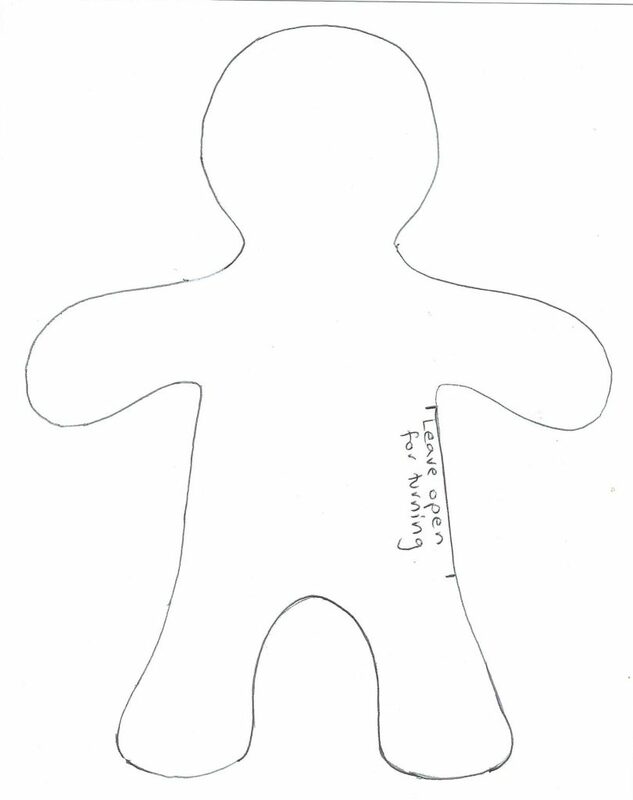 To start with I drew a simple template, and then traced this onto fabric, leaving enough room around each doll for seam allowance. I used an off white homespun I had left over from another project. I think you can get ~7 dolls per metre of fabric (fronts and backs). 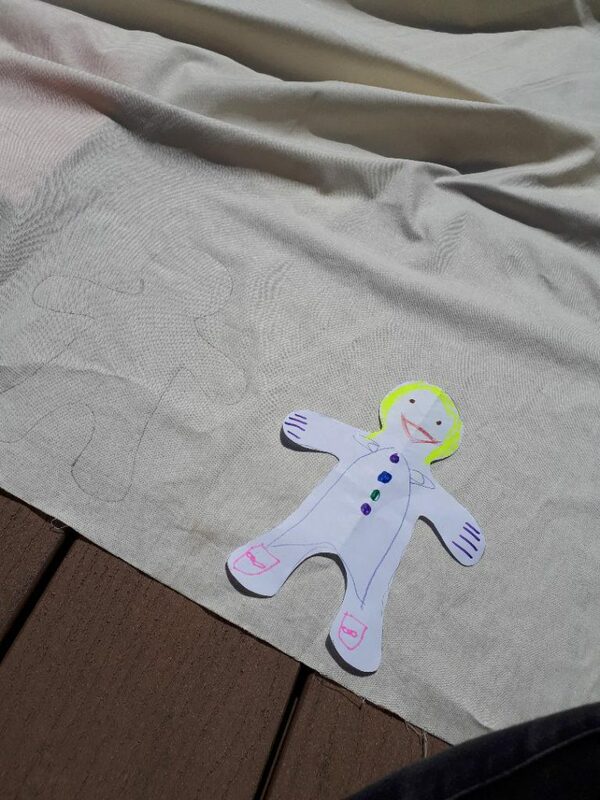 Trace around doll template onto fabric. Don’t you just love my template! Then I gave this to the children (they had two each) along with a bunch of fabric markers. We were using “Stained By Sharpie” and the fabric markers from Ikea, along with some normal sharpies to round out the colour selection (still to be determined how these withstand the test of time). 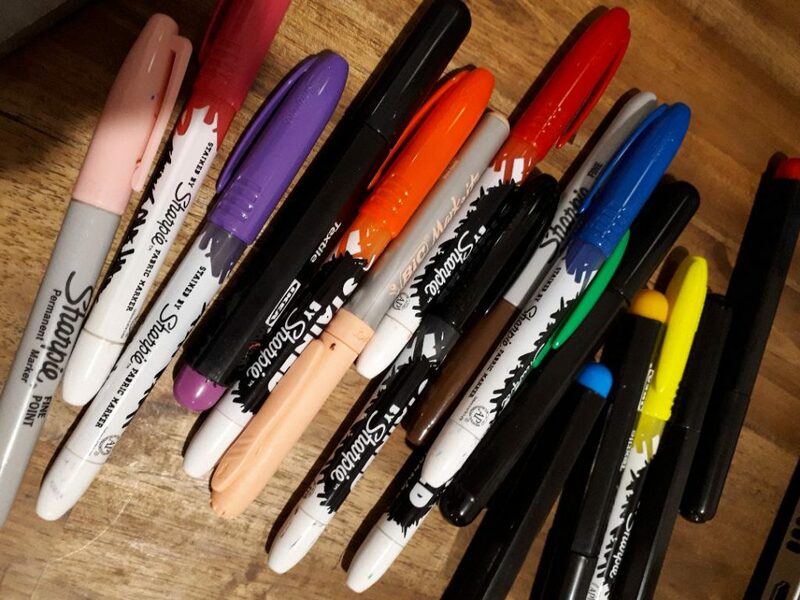 I am looking for a full set of fabric markers with a decent range of colours (hoping for brown, beige, light pink), if you find some, let me know! Then have fun! drawing, colouring, decorating. Make one to look like yourself! A friend? Your favourite character, a character you made, a super hero, JUST DRAW and be creative. There are no rights or wrongs. I took the drawings back to the studio to sew up. The children did not totally stick to the template. 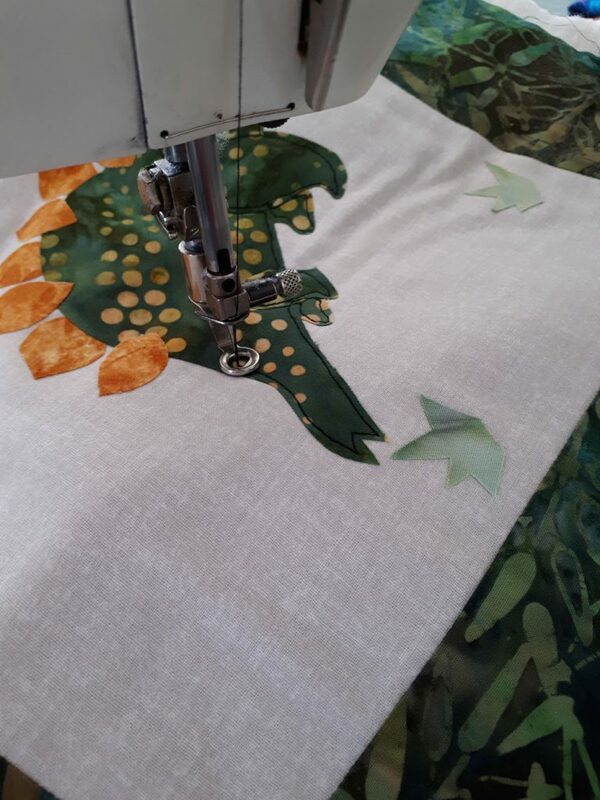 I tried to stay true to their drawings where possible, so I too diverted from the template whilst sewing. This was mostly in the head area where they had added hair, ears and bows. 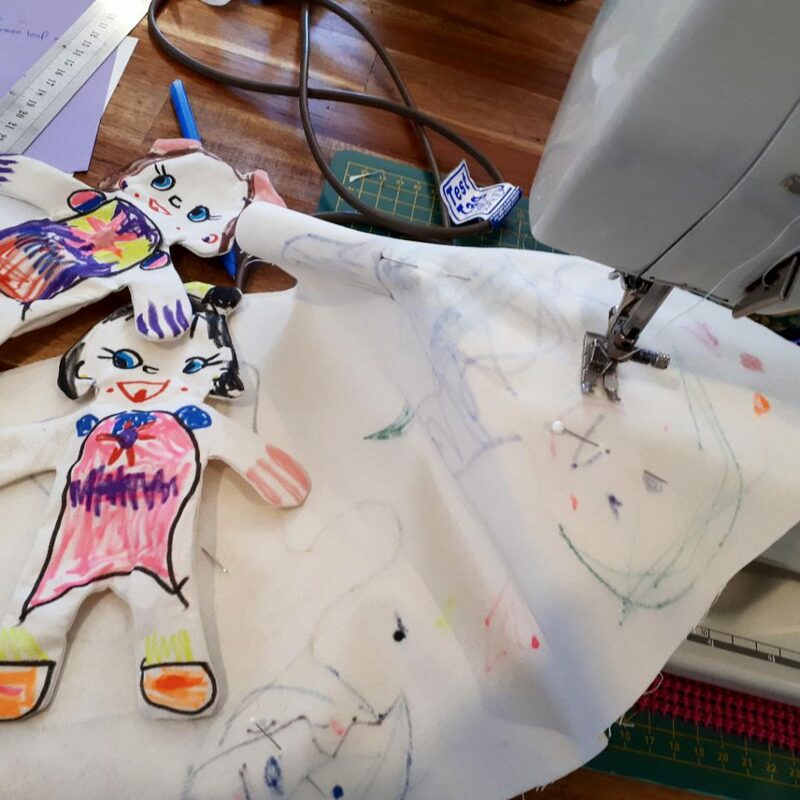 To sew, I took their drawings and laid it right sides together with another piece of fabric. I used the same plain homespun, but if I did it again, I would use something with a pattern. Stitch on the line from the template, or close to the drawings. Make sure you leave a turn out gap! Cut the pieces out a 1/4 inch away from seam. Clip curves and turn right sides out. Use stuffing (poly-fill or something similar) to stuff. Hand stitch opening closed. Stitch on the edge. 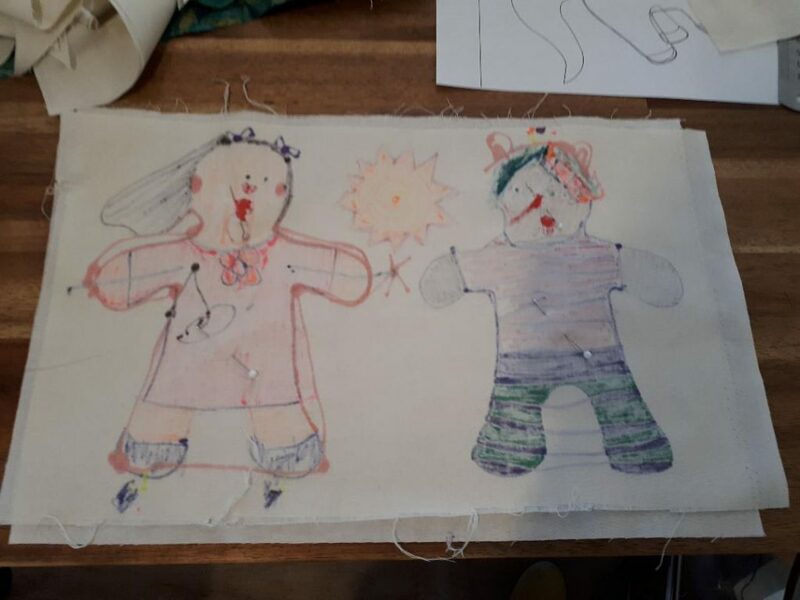 I mostly stuck to the template line, but also tried to stay true to the childrens drawings, so in some parts I have sewn around the drawing instead of staying on the template line. Wala! A gaggle of gorgeous custom dolls! I would love to see what you (and your children) come up with! I do intend on trying to make some simple clothes for them, but that might be a while off yet! Happy “National Craft Month”! I’m not entirely sure which nation this celebration belongs to, but I’m claiming it as my own! Any excuse to celebrate the art of making is a good excuse! I started the month of making strong! 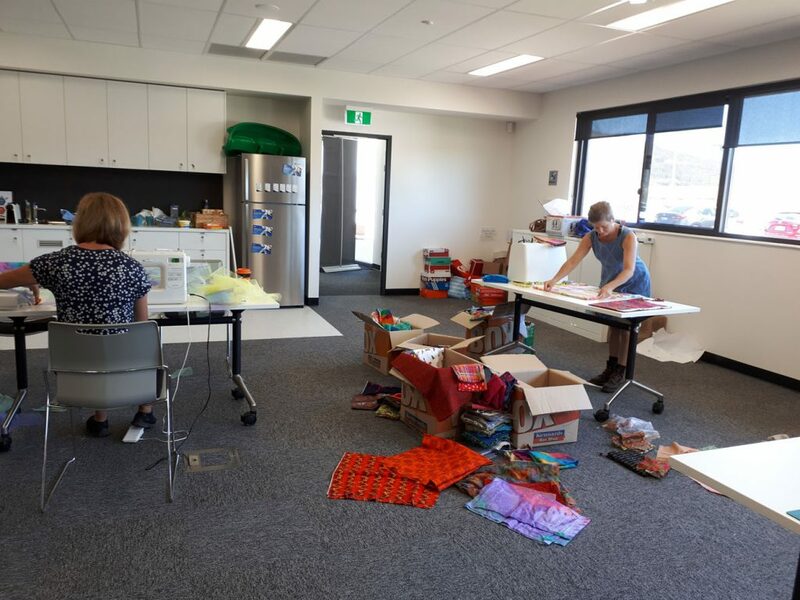 I ventured into my community for a bit of a sewing bee for the local preschool! Hard at work! And yes, those boxes were full of gorgeous fabric! 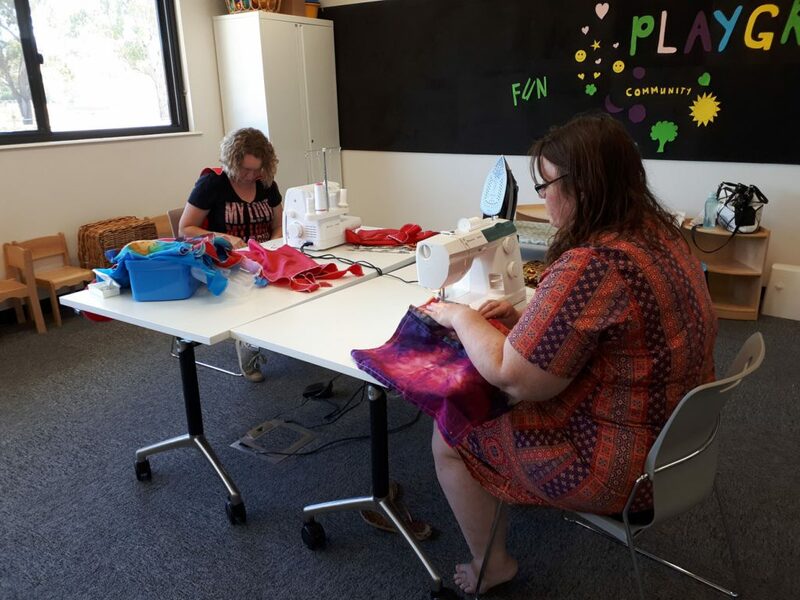 Six lovely ladies came together to sew cushion covers, tutus, capes and skirts! We were lucky to have several boxes of gorgeous fabrics donated to us to assist in this adventure! Honestly, we had a better selection of fabric to work with than what you would find in my cupboard right now! This is what we achieved in just under 2 hours. 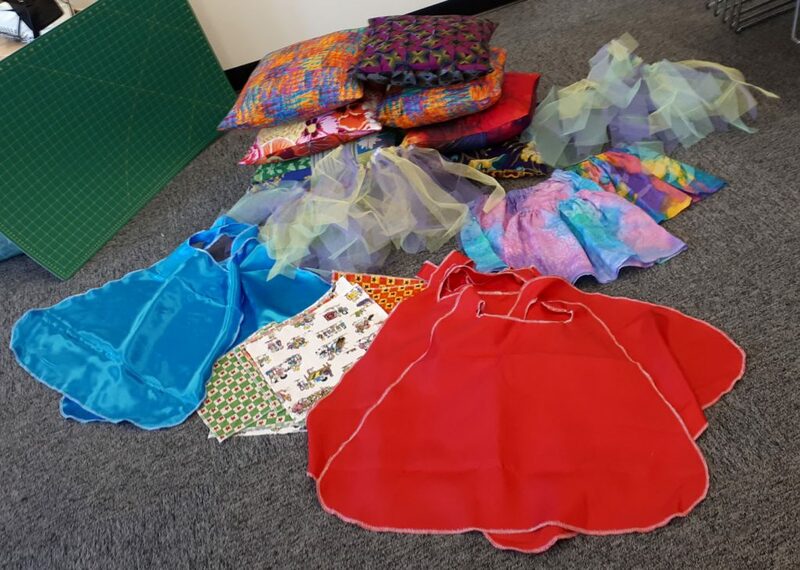 Capes, Cushion covers, skirts, tutus, fabric play squares. I currently have two quilts spread out all over my living room. One is for a friend, and will be gifted later this month, so you will have to wait a little longer to see that one! 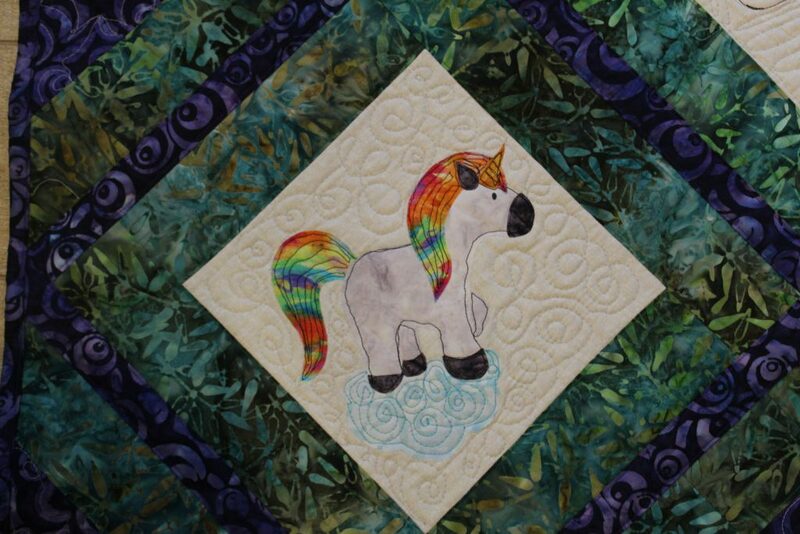 I have taught myself so many new things with this quilt! The other is for the local playgroup. I wandered off with an armful of pre-cut squares after the sewing bee, and have been spending 5 mins here and there putting it together. 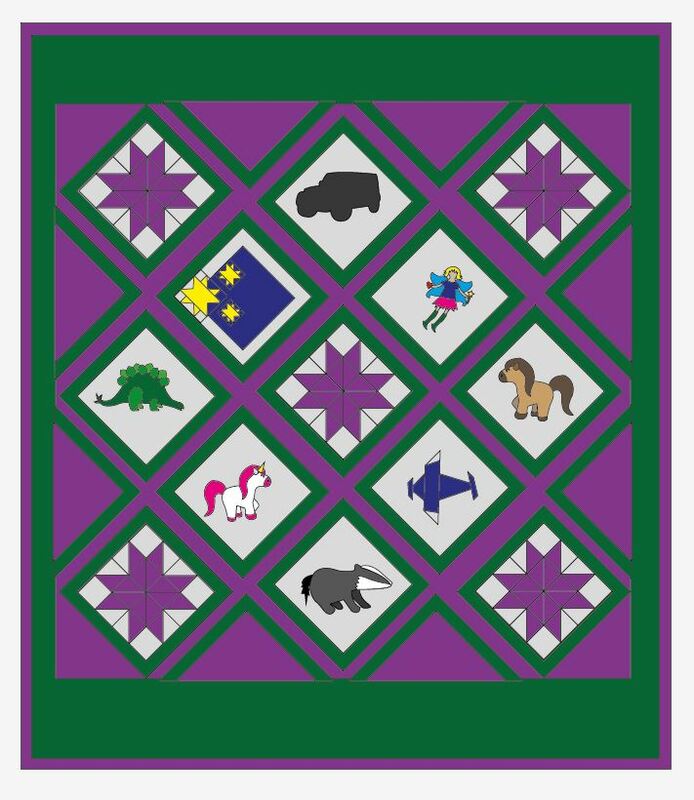 It will become a floor quilt for children to sit on to read stories etc. 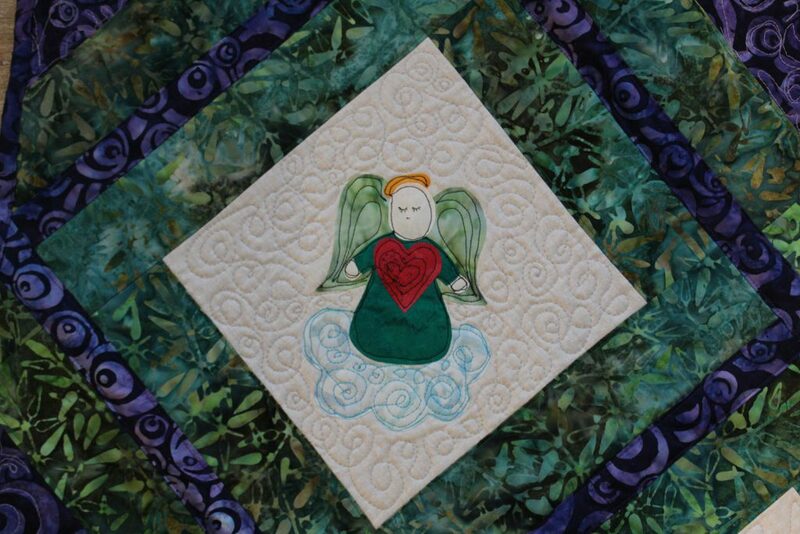 I absolutely love making quilts that will be used. 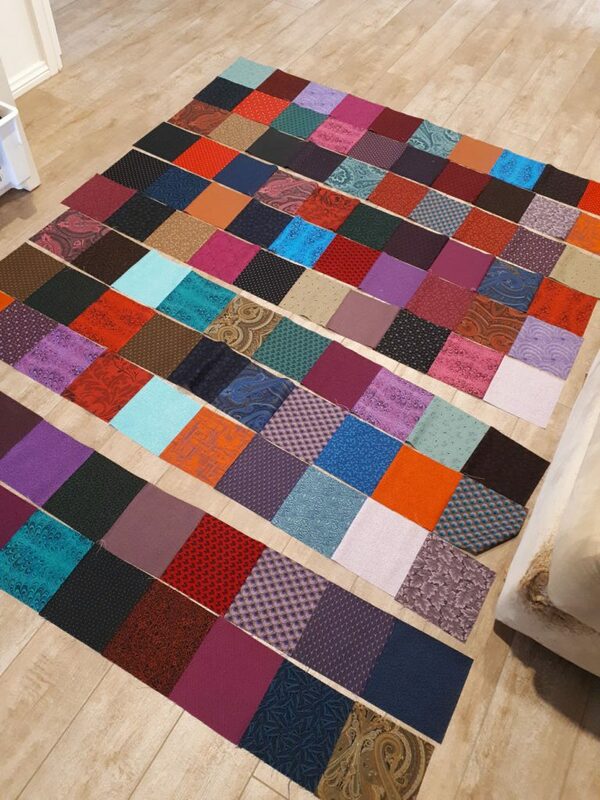 A floor quilt in progress! 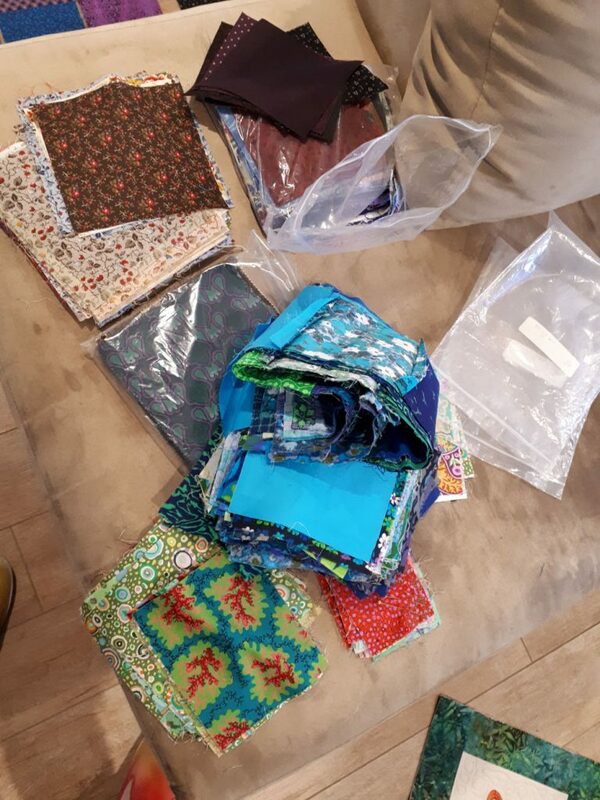 I grabbed enough pre-cuts to make another couple of quilts for the school! So I’m pretty much set for projects for the next few weeks! A couple of years ago, my Aunty approached me to do a demonstration at her local museum which she runs. She asked if I could demonstrate a crochet rag rug, which my mum had actually made. Now, I had not made a rug before, but said yes anyways. 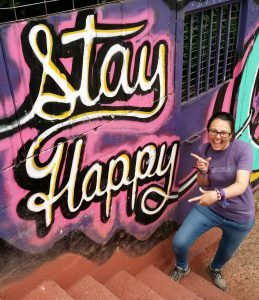 So I spent some time figuring it out, and then writing some instructions, and today, I’m going to share those instructions with you. 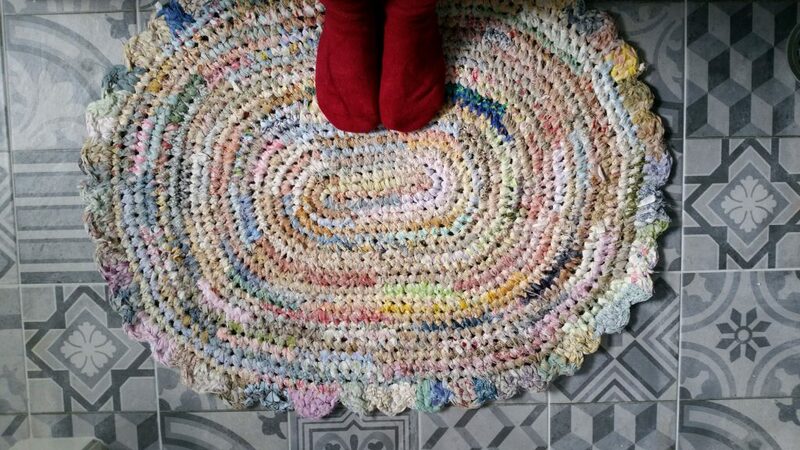 Rag rugs are a great way to transform old, worn textiles into something that is both practical and beautiful. 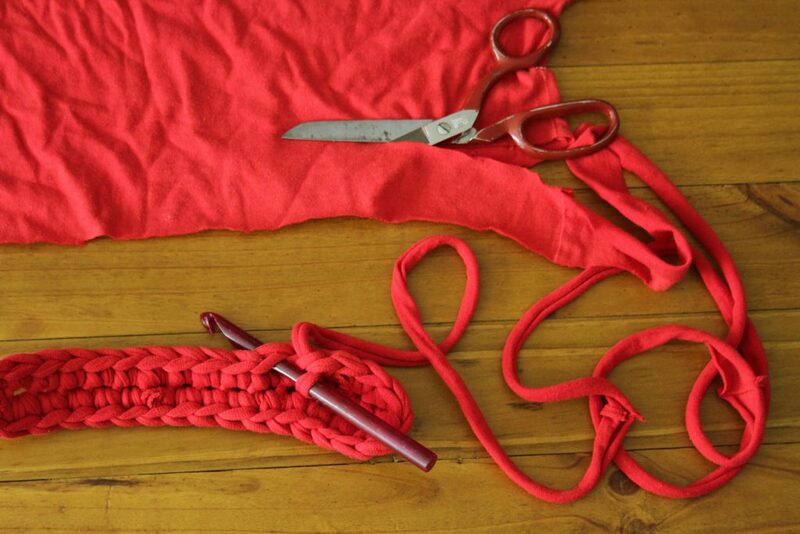 You can crochet your own from materials you have on hand. Last week we looked at ways of making yarn. Now it’s time to crochet! I will give you a run down on how to crochet an oval rug. You could make it any shape you desire of course! But the oval is a good place to start. With the oval rug, you increase on the ends and maintain the sides. the longer the starting chain, the longer and skinnier your rug will be. The shorter your starting chain, the shorter and fatter your rug will be. Be prepared to wander from these instructions. 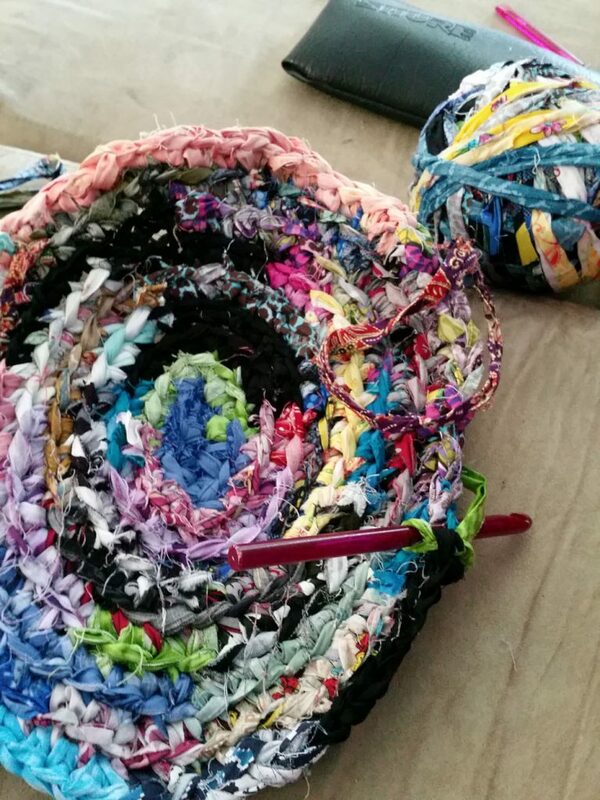 It is hard to give instructions on how to make a rag rug, as variances in yarn can change the way the crochet material acts. When choosing a hook, find a nice big one. The size of your hook could depend on a couple of factors. The width and thickness of your yarn, and your tension – how tight or loose you crochet. I am using an 11.5mm, I find a 10mm to be a nice size too. Test out a couple of hooks and see what works best for you, your yarn and your tension. To begin, make a chain (ch). I find 12 ch to be a nice number. 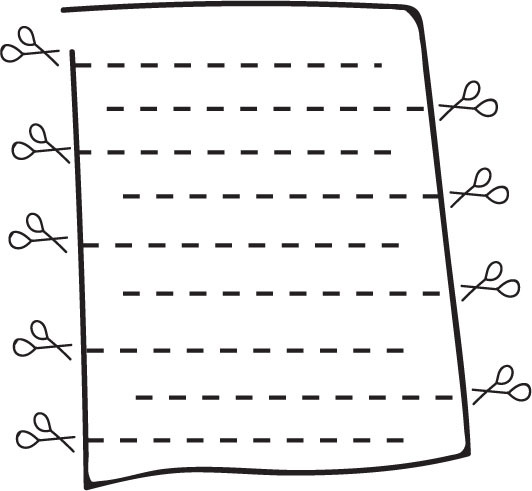 The last two ch equals 1 sc, giving you 10 stitches to work with. Work a single crochet (sc) into the second chain from the hook. Continue to sc into each ch until you reach the last ch. In the last ch do 3 sc to increase. Continue around with 1 sc in each chain until you reach the last ch to increase. On the sides of the rug you will continue with 1 sc into each. Only at the ends will you increase. For the second round of increases sc into each of the stitches on the previous row. When you get to the 3 sc increases on each end, do 2 sc into each. Continue to 1 sc into each sc on the sides. Continue in this manner, 1 sc along the sides and increases at the ends. For each round your increases will get further apart. For example, on the third round you will do 2 sc into one, then 1 sc into one, 2 sc etc. Then on the fourth row increase the sc between increases to 2, so you have 2 sc in once, 1 sc into one, 1 sc into one, 2 sc into one etc. The 5th row you will have 3 sc between increases and son on and so forth until your rug reaches the desired size. You may need to play with where your increases fall and experiment with what works best for your yarn. 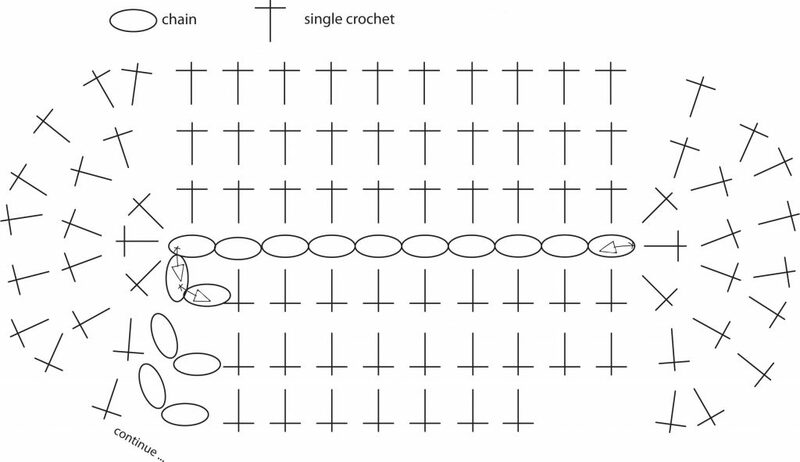 This diagram gives you an idea of how to begin a rag rug, and the first few rows of increases at each end. The finished mat! I added a scalloped edge! Your rug may start to go wobbly or maybe even start turning up like a basket. If it goes wobbly, it means you have too many increases and need to do less increases. If it starts turning up like a basket, it means you have too few increases and you will need to put a few more increases in. If, when you finish, your rug won’t lay flat, you can try blocking it. To do this you will need to lay it out on something that can get a bit damp. I have a piece of acoustic board which I cover in towels, and I can pin directly into. A plastic sheet on some carpet will work the same as well. Lay your rug out and pin down. Moisten the rug with water. Move your hands over the cloth and press down on any places in need of smoothing out. Stretch, pin and shape as necessary. Allow to dry, then unpin. Another project in progress. This one became a cat bed. I stopped increasing for the last few rows to allow edges to form. I have made baskets and bags in this way too. I love working with scrappy yarn, it gives so much texture. There are many different things you could make besides a rug. What else can you think of? I want to share with you some instructions for a crochet rag rug I wrote a couple of years ago now, but I thought I’d break it down into two parts. Today I want to show you some ways to turn textiles you have laying around the house into yarn, which I consider nice yarn for these rag rugs. 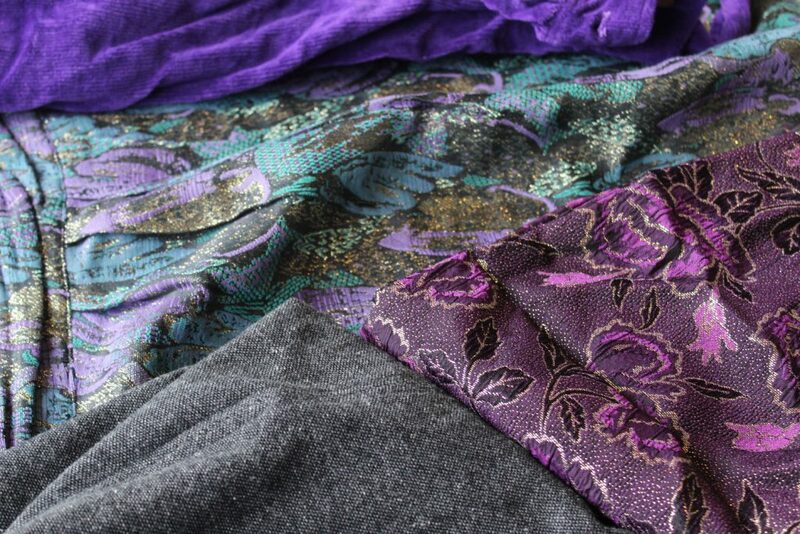 Rag yarn can be made from various textiles, including old clothes, bed linen and off cuts from craft fabrics. The best I have found to work with are old cotton t-shirts, bed sheets and all the long strips leftover from quilting projects. Knitted and woven fabrics give you different effects. Knitted fabric, with a light tug, will roll in on itself and give you a nice round yarn to work with. Once crochet, it has a nice clean, contemporary look about it. 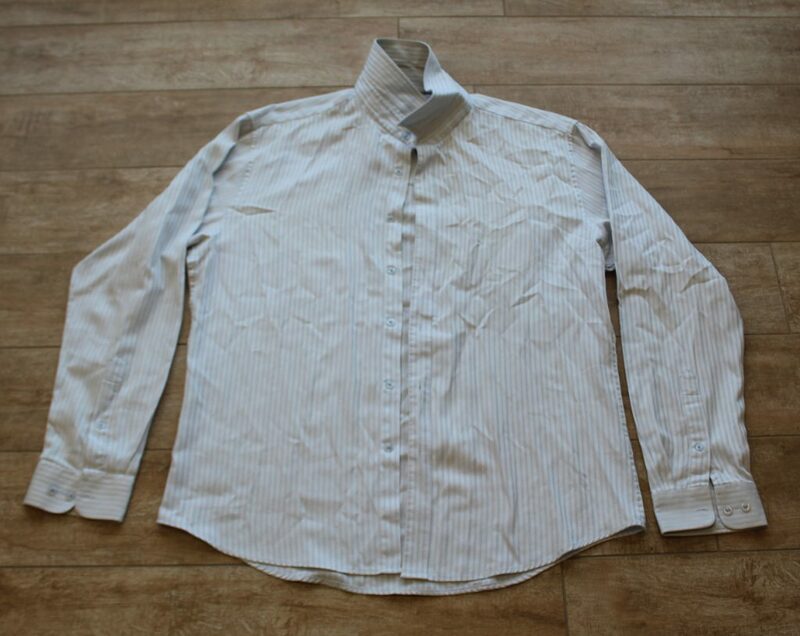 Woven fabric on the other hand, stays flat and has an inherent fray to the edges. This produces a rustic look. Both are beautiful in their own right. And both equal in their ease of use. Once you have created your yarn, I reccomend rolling it into a big ball. This will stop it from tangling up. Now, I’ve always hand rolled my balls, but recently I’ve seen Gypsy Weaver Studio working with rag yarn using a ball winder, and I think this is a fabulous idea! When cutting your yarn, it is ideal to have a width of 1.5 – 2 inches. A rough estimate is all that is needed as any discrepencies will dissappear in the crochet stitches. 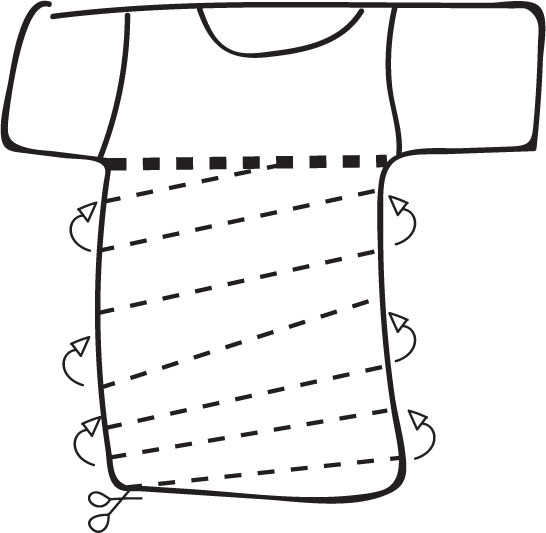 To cut continuous yarn from a t-shirt, cut straight across the top just below the arms. starting at the bottom, cut in a spiral to the top. 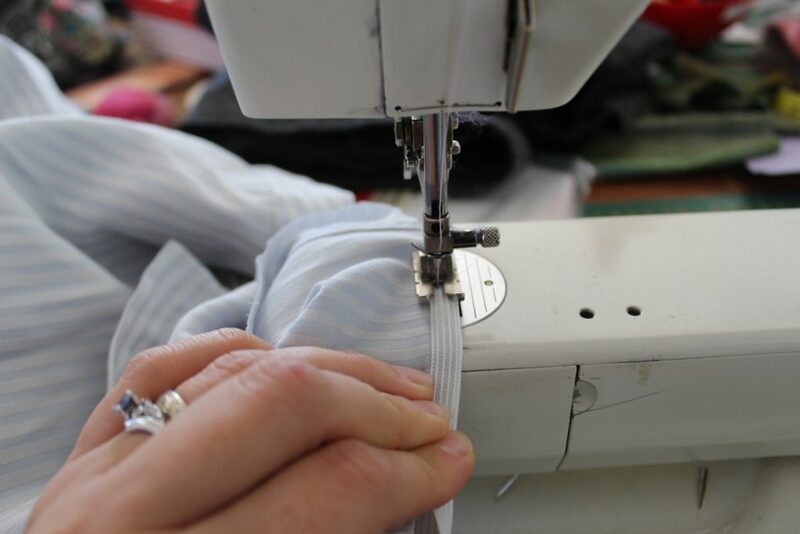 To cut continuous yarn from a sheet or large piece of fabric you have two options. 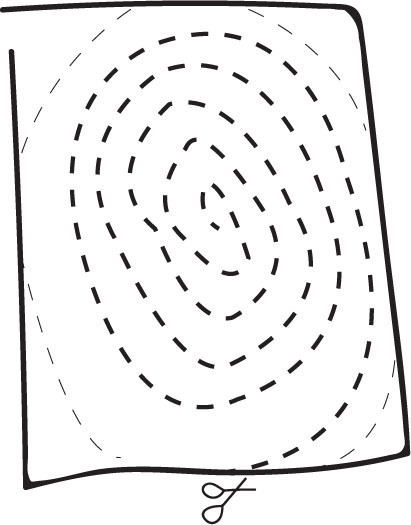 The first option is to round off the corners and cut in a spiral until you get to the middle. 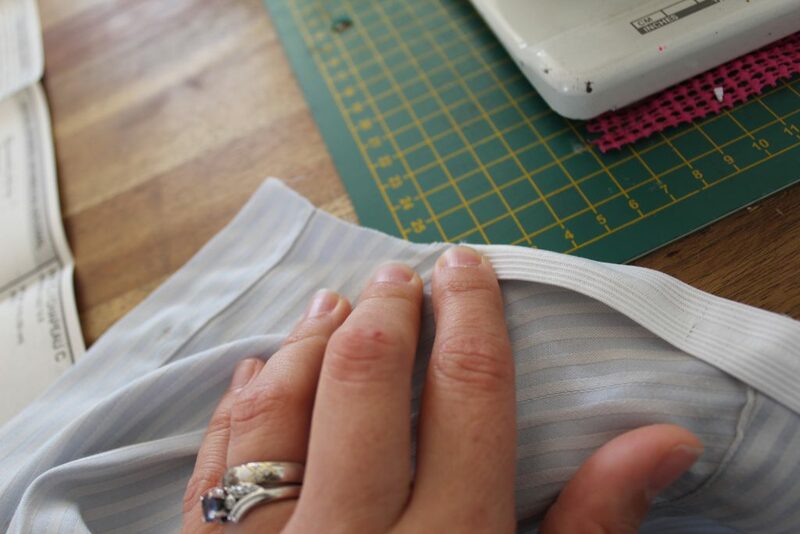 The other option is to start on one edge and cut strips twice as wide as you want your finished strips to be, making sure you stop about 2cm from the edge. Then, from the other edge, cut straight down the middle of those strips, again, making sure you stop before you get to the edge. 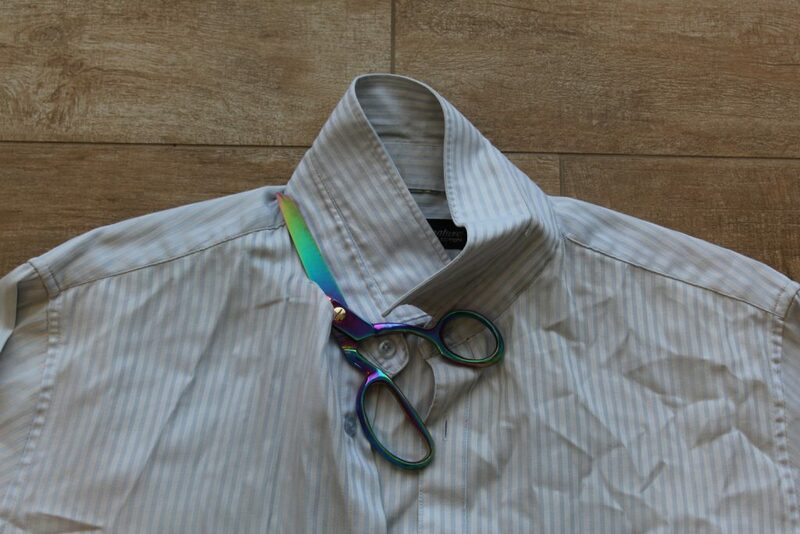 I use this technique a lot, especially when dealing with fabric off cuts that are a tad too big and need to be cut down. Cut from each side, making sure not to cut right through! Now, I personally work with a lot of patchwork off cuts (mostly because people are always giving mum scraps!) and that means working with a lot of smaller lengths, so of course you are going to have to join them! You can just knot them, and use them as a feature! Marion has successfully done this with a rag rug and made the knots sit on the top of the rug for a kind of “pile” look. But it that’s not what your going for you will need a some what invisible way to join them. You could sew them together. I’m too lazy for that and use a slip knot technique. 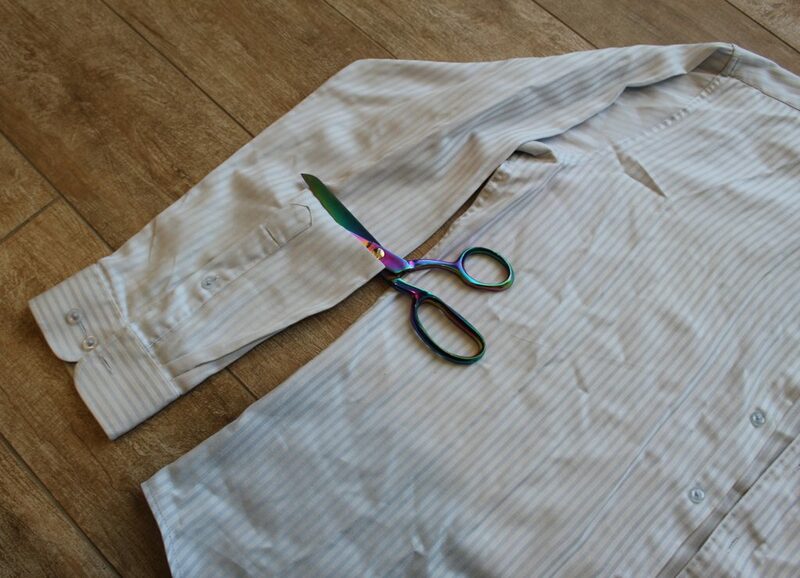 Cut slits in the ends of the pieces you want to join. Slip the end of one of your strips through the slit of the other, then through the slit of itself. gently pull until the join rests neatly within itself. Cutting can be hard on your hands. As can crocheting with bulky yarns. Make sure you give yourself plenty of breaks and listen to your body! I’ll be back next week with a brief over view on how I made a rag rug! Lets flash back to 2014. I made a soft portrait of the one and only Guy. For the first six years of our relationship, everything was about paintball! Guy lived, ate and slept paintball! So it made sense (at least at the time lol) to portray him in his paintball essence! 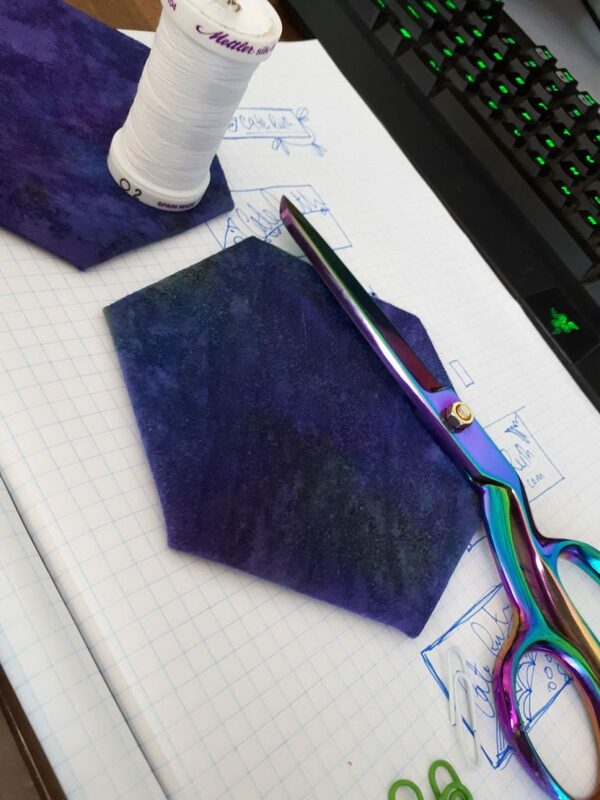 I started out sketching a pattern, then starting to work in fabric. I worked the details with embroidery. Can you see all that beautiful hair I embroidered, just to sew a sandanna over the top! haha! 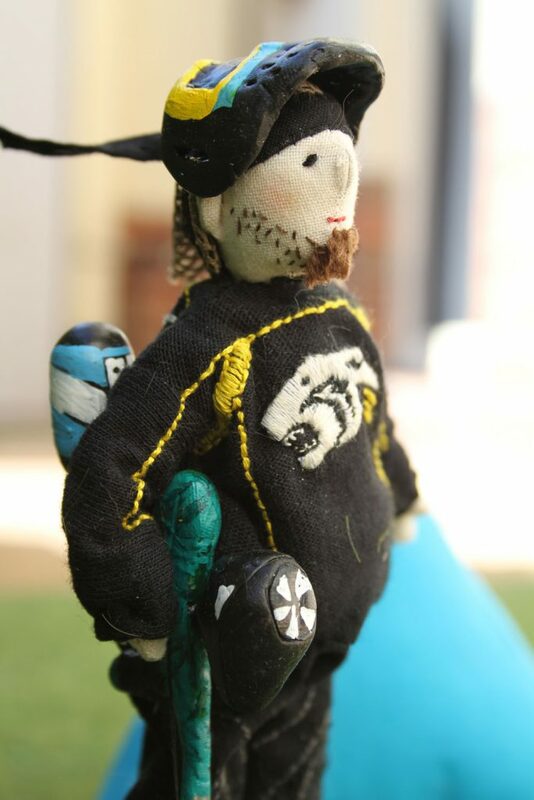 Arms and legs were stitched directly to the body. 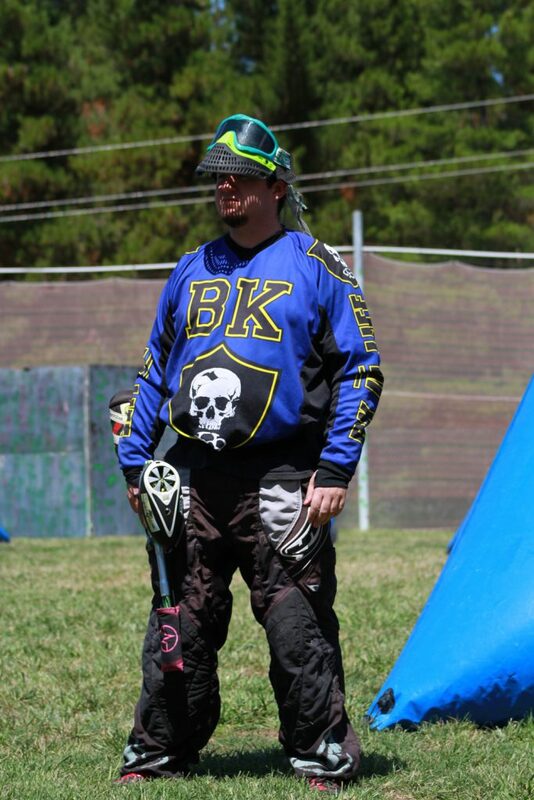 Even the pants got the embroidery treatment to look more like paintball pants! I shaped a pb marker and goggles from wire, aluminium foil and polymer clay, and Guy helped me paint them. More embroidery for the jersey. His actual real life jersey is on the left. If I were to make a softie portrait of Guy today, It would be suite wearing, cheeky grinning corporate Guy! But his heart is still the same funny, cheeky, caring one that I met some 11 years ago. Happy Valentines Day. 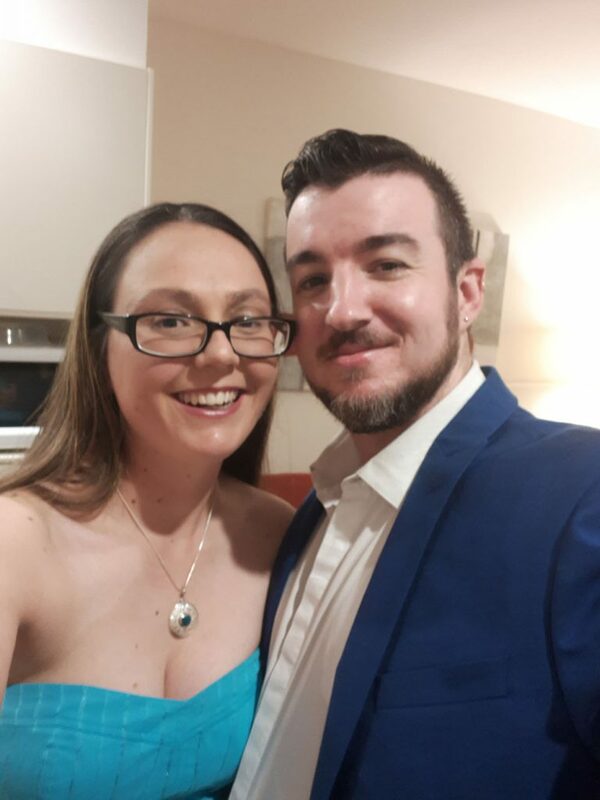 Even if you don’t have a “valentine” I hope you take a moment to appreciate those that you love, those that take you on those crazy adventures and those that make your life that little bit special!